Hamilton, Khaki Navy UTC Auto, Men's Watch, Stainless Steel Case, Leather Strap, Swiss Mechanical Automatic (Self-Winding). And buy this Hamilton Men's Khaki Navy UTC Auto Watch Model: H77525553 Retail: $1,345 Special: $588 + Free Shipping! Use code: AFFNAVY588 at checkout. Offer Expires: 6/11 at 11:59 pm. Rado, Rado True, Men's Watch, Ceramic with Plasma Treatment Case, Ceramic with Plasma Treatment Bracelet, Swiss Quartz (Battery-Powered). So buy this Rado Men's Rado True Watch Model: R27654162 Retail: $1,300 Special: $448 + Free Shipping! Use code: AFFRTRUE448 at checkout. Offer Expires: 6/11 at 11:59 pm. Edox, Les Vauberts Day Date Automatic, Men's Watch, Stainless Steel Case, Stainless Steel Bracelet, Swiss Mechanical Automatic (Self-Winding). And buy this Edox Men's Les Vauberts Day Date Automatic Watch Model: 83011-3N-NIN Retail: $1,800 Special: $425 + Free Shipping! Use code: AFFLESVB425 at checkout. Offer Expires: 6/11 at 11:59 pm. Calvin Klein, Exchange, Men's Watch, Stainless Steel Case, Stainless Steel Bracelet, Swiss Quartz (Battery-Powered). So buy this Calvin Klein Men's Exchange Watch Model: K2F27161 Retail: $410 Special: $88 + Free Shipping! Use code: AFFXCHANG88 at checkout. Offer Expires: 6/11 at 11:59 pm. ESQ by Movado, One, Men's Watch, Stainless Steel and Silicon Case, Silicon Strap, Swiss Quartz (Battery-Powered). And buy this ESQ by Movado Men's One Watch Model: 07301453 Retail: $195 Special: $34.99 + Free Shipping! Use code: AFFONE34 at checkout. Offer Expires: 6/11 at 11:59 pm. Armand Nicolet, TM7 Complete Calendar, Men's Watch, Stainless Steel Case, Leather Alligator Strap, Swiss Mechanical Automatic (Self-Winding). And buy this Armand Nicolet Men's TM7 Complete Calendar Watch Model: 9632A-AG-P968MR3 Retail: $6,900 Special: $1,295 + Free Shipping! Use code: AFFCALENDAR1295 at checkout. Expires: 6/6 at 11:59 pm. Raymond Weil, Freelancer, Men's Watch, Stainless Steel Case, Stainless Steel Bracelet, Swiss Mechanical Automatic (Self-Winding). So buy this Raymond Weil Men's Freelancer Watch Model: 2770-ST-20011 Retail: $1,750 Special: $499 + Free Shipping! Use code: AFFREELNC499 at checkout. Offer Expires: 6/6 at 11:59 pm. Rado, Coupole L, Men's Watch, Stainless Steel and Rose Gold Plated PVD Coated Case, Stainless Steel and PVD Coating Bracelet, Swiss Quartz (Battery-Powered). And buy this Rado Men's Coupole L Watch Model: R22852183 Retail: $1,350 Special: $450 + Free Shipping! Use code: AFFCOUPOLE450 at checkout. Offer Expires: 6/6 at 11:59 pm. Movado, Metio, Men's Watch, Stainless Steel Case, Stainless Steel Bracelet, Swiss Quartz (Battery-Powered). So buy this Movado Men's Metio Watch Model: 0606203 Retail: $795 Special: $219 + Free Shipping! Use code: AFFMETIO219 at checkout. Offer Expires: 6/6 at 11:59 pm. Pulsar, Business, Men's Watch, Stainless Steel Gray Ion Plated Case, Stainless Steel and Gray Ion Plated Bracelet, Japanese Quartz (Battery-Powered). And buy this Pulsar Men's Business Watch Model: PT3289 Retail: $199.95 Special: $45 + Free Shipping! Use code: AFFBUSINESS45 at checkout. Offer Expires: 6/6 at 11:59 pm. Zenith, Captain Central Second, Men's Watch, 18K Rose Gold Case, Leather Alligator Over Rubber Strap, Swiss Mechanical Automatic (Self-Winding). And buy this Zenith Men's Captain Central Second Watch Model: 18-2020-670-11-C498 Retail: $14,500 Special: $5,188 + Free Shipping! Use coupon code: AFFCAPTAIN5188 at checkout. Offer Expires: 4/20 at 11:59 pm. Rado, D-Star, Men's Watch, Stainless Steel Case, Stainless Steel Bracelet, Swiss Mechanical Automatic (Self-Winding). And buy this Rado Men's D-Star Watch Model: R15513153 Retail: $1,395 Special: $599 + Free Shipping! Use code: AFFRADOSTAR599 at checkout. Offer Expires: 4/20 at 11:59 pm. Movado Men's or Women's Museum Watch Models: 2100005, 2100006 Retail: $595 Special: $215 + Free Shipping! Use code: AFFMUSEUM215 at checkout. Offer Expires: 4/20 at 11:59 pm. Calvin Klein, Exchange, Men's Watch, Stainless Steel Case, Leather Strap, Swiss Quartz (Battery-Powered). So buy this Calvin Klein Men's Exchange Watch Model: K2F27107 Retail: $385 Special: $80 + Free Shipping! Use code: AFFEXCHANGE80 at checkout. Offer Expires: 4/20 at 11:59 pm. Bell and Ross, Aviation BR01 Flight Instruments, Men's Watch, Stainless Steel Black PVD Coated Case, Rubber Strap, Swiss Mechanical Automatic (Self-Winding). And buy this Bell and Ross Men's Aviation BR01 Flight Instruments Watch Model: BR01-CLIMB Retail: $5,500 Special: $1,798 + Free Shipping! Use code: AFFCLIMB1798 at checkout. Offer Expires: 4/6 at 11:59 pm. Rado, R5.5, Men's Watch, Ceramic Case, Ceramic Bracelet, Swiss Quartz (Battery-Powered). So buy this Rado Men's R5.5 Chronograph Watch Model: R28886182 Retail: $3,000 Special: $599 + Free Shipping! Use code: AFFCHRONO599 at checkout. Offer Expires: 4/6 at 11:59 pm. Zenith, Port Royal, Men's Watch, Stainless Steel Case, Stainless Steel Bracelet, Swiss Mechanical Manual (Hand-Winding). And buy this Zenith Men's Port Royal Watch Model: 03-5010-2562-01M5010 Retail: $5,600 Special: $2,068 + Free Shipping! Use code: AFFPORT2068 at checkout. Offer Expires: 3/30 at 11:59 pm. Movado, SE Extreme, Men's Watch, Stainless Steel Case, Stainless Steel Bracelet, Swiss Mechanical Automatic (Self-Winding). And buy this Movado Men's SE Extreme Watch Model: 0606700 Retail: $2,595 Special: $749 + Free Shipping! Use code: AFFEXTREME749 at checkout. Offer Expires: 3/30 at 11:59 pm. Rado, D-Star Chronograph, Men's Watch, Ceramos (Hi-Tech Ceramic and Metal Composite) Case, Stainless Steel Bracelet, Swiss Quartz (Battery-Powered). And buy this Rado Men's D-Star Chronograph Watch Model: R15937203 Retail: $1,950 Special: $599 + Free Shipping Use code: AFFSTAR599 at checkout. Offer Expires: 3/30 at 11:59 pm. Raymond Weil, Maestro Automatic Date, Men's Watch, Stainless Steel Case, Leather Strap, Swiss Mechanical Automatic (Self-Winding). So buy this Raymond Weil Men's Maestro Automatic Date Watch Model: 2847-STC-20001 Retail: $1,495 Special: $498 + Free Shipping! Use code: AFFAUTO498 at checkout. Offer Expires: 3/30 at 11:59 pm. Calvin Klein Women's Window Watch Now $60! Calvin Klein, Window, Women's Watch, Stainless Steel Case, Leather Strap, Swiss Quartz (Battery-Powered). So buy this Calvin Klein Women's Window Watch Model: K2M23107 Retail: $305 Special: $60 + Free Shipping! Use Code: AFFWINDOW60. Offer Expires: 3/23 at 11:59 pm. Zenith, El Primero Stratos Flyback, Men's Watch, Stainless Steel Case, Rubber Strap, Swiss Mechanical Automatic (Self-Winding). So buy this Zenith Men's El Primero Stratos Flyback Watch Model: 03-2067-405-51-R514 Retail: $8,500 Special: $3,495 + Free Shipping! Use Code: AFFPRIME3495 at checkout. Offer Expires: 3/12 at 11:59 pm. Hamilton, Khaki Field Pioneer Auto Chrono, Men's Watch, Stainless Steel Case, Leather Strap, Swiss Mechanical Automatic (Self-Winding). So buy this Hamilton Men's Khaki Field Pioneer Auto Chrono Watch Model: H60416583 Retail: $1,945 Special: $699 + Free Shipping! Use Code: AFFFIELD699 at checkout. Offer Expires: 3/12 at 11:59 pm. Baume and Mercier, Classima Executives, Men's Watch, Stainless Steel Case, Leather Strap, Swiss Quartz (Battery-Powered). And buy this Baume and Mercier Men's Classima Executives Watch Model: MOA10181 Retail: $1,650 Special: $599 + Free Shipping! Use Code: AFFCLASS599 at checkout. Offer Expires: 3/12 at 11:59 pm. Rado, Rado True, Men's Watch, Ceramic with Plasma Treatment Case, Ceramic with Plasma Treatment Bracelet, Swiss Quartz (Battery-Powered). So buy this Rado Men's Rado True Watch Model: R27654122 Retail: $1,300 Special: $448 + Free Shipping! Use code: AFFTRUE448 at checkout. Offer Expires: 3/12 at 11:59 pm. Calvin Klein, Wordly, Men's Watch, Stainless Steel Case, Leather Strap, Swiss Quartz (Battery-Powered). So buy this Calvin Klein Men's Wordly Watch Model: K4A211C6 Retail: $330 Special: $75 + Free Shipping! Use Code: AFFWORD75 at checkout. Offer Expires: 3/12 at 11:59 pm. Save $250 Off on $1,990 Orders! Save $250 Off on $1,990 Orders Excludes Sale Items. Use coupon code: AFF250 at checkout. Shop Now. Expires: 3/31 at 11:59 pm. Save $625 Off on $4,890 Orders! Save $625 Off on $4,890 Orders Excludes Sale Items. Use coupon code: AFF625 at checkout. Shop Now. Offer Expires: 3/31 at 11:59 pm. Save 1,295$ Off on $8,990 Orders!! Save 1,295$ Off on $8,990 Orders Excludes Sale Items. Use coupon code: AFF1295 at checkout. Shop Now. Offer Expires: 3/31 at 11:59 pm. Save 2,200$ Off on $15,000 Orders!! Save 2,200$ Off on $15,000 Orders Excludes Sale Items. Use coupon code: AFF2200 at checkout. Shop Now. Offer Expires: 3/31 at 11:59 pm. Save 3,000$ Off on $20,000 Orders Excludes Sale Items!! Save $3,000 Off on $20,000 Orders Excludes Sale Items. Use coupon code: AFF3000 at checkout. Offer Expires: 3/31 at 11:59 pm. Shop Now. JeanRichard, Terrascope, Men's Watch, Stainless Steel Case, Stainless Steel Bracelet, Swiss Mechanical Automatic (Self-Winding). And buy this JeanRichard Men's Terrascope Watch Model: 60500-11-201-11A Retail: $3,500 Special: $799 + Free Shipping! Use code: AFFTERRA799 at checkout. Offer Expires: 3/8 at 11:59 pm. Rado, Esenza, Women's Watch, Stainless Steel Case, Stainless Steel Bracelet Mesh Style, Swiss Quartz (Battery-Powered). And buy this Rado Women's Esenza Watch Model: R53743163 Retail: $900 Special: $299 + Free Shipping! Use Code: AFFESENZA299 at checkout. Offer Expires: 3/8 at 11:59 pm. Edox, Les Vauberts, Men's Watch, Stainless Steel Case, Leather Strap, Swiss Quartz (Battery-Powered). So buy this Edox Men's Les Vauberts Watch Model: 70172-3A-AIN Retail: $718 Special: $159 + Free Shipping! Use Code: AFFLES159 at checkout. Offer Expires: 3/8 at 11:59 pm. Calvin Klein, Graceful, Women's Watch, Stainless Steel Case, Stainless Steel Bracelet, Swiss Quartz (Battery-Powered). And buy this Calvin Klein Women's Graceful Watch Model: K1P23126 Retail: $350 Special: $80 + Free Shipping! Use Code: AFFGRAC80 at checkout. Offer Expires: 3/8 at 11:59 pm. Baume and Mercier, Classima Executives, Men's Watch, Stainless Steel Case, Stainless Steel Bracelet, Swiss Mechanical Automatic (Self-Winding). So buy this Baume and Mercier Men's Classima Executives Watch Model: MOA08732 Retail: $3,980 Special: $1,378 + Free Shipping! Use Code: AFFCLASS1378 at checkout. Offer Expires: 2/22 at 11:59 pm. Hamilton, Jazzmaster Regulator, Men's Watch, Stainless Steel Case, Leather Strap, Swiss Mechanical Automatic (Self-Winding). So buy this Hamilton Men's Jazzmaster Regulator Watch Model: H42615753 Retail: $1,275 Special: $498 + Free Shipping! Use Code: AFFJAZZ498 at checkout. Offer Expires: 2/22 at 11:59 pm. Rado, Original, Men's Watch, Stainless Steel Case, Stainless Steel Bracelet, Swiss Mechanical Automatic (Self-Winding). So buy this Rado Men's Original Watch Model: R12408653 Retail: $1,100 Special: $365 + Free Shipping! Use Code: AFFORIGIN365 at checkout. Offer Expires: 2/22 at 11:59 pm. Raymond Weil, Tradition, Men's Watch, Stainless Steel Case, Stainless Steel Bracelet, Swiss Quartz (Battery-Powered). So buy this Raymond Weil Men's Tradition 42 mm Watch Model: 5578-ST-00300 Retail: $1,050 Special: $299 + Free Shipping! Use Code: AFFTRADTN299 at checkout. Offer Expires: 2/22 at 11:59 pm. Calvin Klein, Exquisite, Women's Watch, Stainless Steel Yellow Gold Plated Case, Stainless Steel Gold Plated Bracelet Bangle Type, Swiss Quartz (Battery-Powered). So buy this Calvin Klein Women's Exquisite Watch Model: K1Y23209 Retail: $445 Special: $88 + Free Shipping! Use Code: AFFEXQUISITE88 at checkout. Offer Expires: 2/22 at 11:59 pm. Calvin Klein, Gentle, Women's Watch, Stainless Steel Case, Stainless Steel Bracelet, Swiss Quartz (Battery-Powered). So buy this Calvin Klein Women's Gentle Watch Model: K3L33166 Retail: $380 Special: $70 + Free Shipping! Use code: AFFGENTLE70 at checkout. Offer Expires: 1/30 at 11:59 pm. Seiko, Chronograph, Men's Watch, Stainless Steel Black Plated Case, Leather Calf Skin Strap, Japanese Quartz (Battery-Powered). And buy this Seiko Men's Chronograph Watch Model: SKS439 Retail: $280 Special: $74.99 + Free Shipping! Use code: AFFCHRONO74 at checkout. Offer Expires: 1/30 at 11:59 pm. Movado, Linio, Women's Watch, Stainless Steel Case, Stainless Steel Bracelet, Swiss Quartz (Battery-Powered). And buy this Movado Women's Linio Watch Model: 0606736 Retail: $750 Special: $199 + Free Shipping! Use code: AFFLINIO199 at checkout. Offer Expires: 1/30 at 11:59 pm. Hamilton, Khaki Field Pioneer Auto, Men's Watch, Stainless Steel Case, Leather Strap, Swiss Mechanical Automatic (Self-Winding). And buy this Hamilton Men's Khaki Field Pioneer Auto Watch Model: H60515593 Retail: $945 Special: $429 + Free Shipping! Use code: AFFPIONR429 at checkout. Offer Expires: 1/30 at 11:59 pm. Rado, Integral, Men's Watch, Stainless Steel Case, Stainless Steel and Ceramic Bracelet, Swiss Mechanical Automatic (Self-Winding). And buy this Rado Men's Integral Automatic Watch Model: R20852702 Retail: $2,800 Special: $988 + Free Shipping! Use code: AFFAUTO988 at checkout. Offer Expires: 1/30 at 11:59 pm. Movado, Sport Edge, Men's Watch, Stainless Steel Case, Rubber Strap, Swiss Quartz (Battery-Powered). And buy this Movado Men's Sport Edge Watch Model: 0606926 Retail: $795 Special: $249 + Free Shipping! Use Code: AFFSPORT249 at checkout. Offer Expires: 1/11 at 11:59 pm. Rado, R5.5, Men's Watch, Ceramic Case, Ceramic Bracelet, Swiss Quartz (Battery-Powered). So buy this Rado Men's R5.5 Watch Model: R28888162 Retail: $2,400 Special: $499 + Free Shipping! Use Code: AFFRADO499 at checkout. Offer Expires: 1/11 at 11:59 pm. Armand Nicolet, TM7 Day & Date, Men's Watch, Stainless Steel Case, Stainless Steel Bracelet, Swiss Mechanical Automatic (Self-Winding). So buy this Armand Nicolet Men's TM7 Day & Date Watch Model: 9630A-AG-M9630 Retail: $3,700 Special: $669 + Free Shipping! Use Code: AFFDAY669 at checkout. Offer Expires: 1/11 at 11:59 pm. Bulova Accutron, Pemberton, Women's Watch, Stainless Steel Case, Stainless Steel Bracelet, Swiss Quartz (Battery-Powered). And buy this Bulova Accutron Women's Pemberton Watch Model: 63R138 Retail: $1,595 Special: $239 + Free Shipping! Use Code: AFFPEMBER239 at checkout. Offer Expires: 1/4/16 at 11:59 pm. Movado Men's or Women's Collection Watch Models: 0606276, 0606277 Retail: $995 Special: $279 + Free Shipping! Use Code: AFFCOLLECT279 at checkout. Offer Expires: 1/4/16 at 11:59 pm. Edox, Les Vauberts Automatic, Men's Watch, Stainless Steel Case, Leather Strap, Swiss Mechanical Automatic (Self-Winding). So buy this Edox Men's Les Vauberts Automatic Watch Model: 85010-3N-NIN Retail: $1,350 Special: $339 + Free Shipping! Use Code: AFFLES339 at checkout. Offer Expires: 1/4/16 at 11:59 pm. Rado, Centrix, Women's Watch, Stainless Steel Case, Stainless Steel Bracelet, Swiss Mechanical Automatic (Self-Winding). So buy this Rado Women's Centrix Watch Model: R30940163 Retail: $1,275 Special: $538 + Free Shipping! Use Code: AFFCENTRIX538 at checkout. Offer Expires: 1/4/16 at 11:59 pm. Armand Nicolet, M02, Men's Watch, 18K Rose Gold Case, Leather Alligator Strap, Swiss Mechanical Automatic (Self-Winding). So buy this Armand Nicolet Men's Mo2 Watch Model: 7141A-NR-P914NR2 Retail: $18,500 Special: $3,888 + Free Shipping! Use Code: AFFAN3888 at checkout. Offer Expires: 1/4/16 at 11:59 pm. Calvin Klein, Sophistication, Women's Watch, Stainless Steel Case, Leather Strap, Swiss Quartz (Battery-Powered). So buy this Calvin Klein Women's Sophistication Watch Model: K1B33108 Retail: $330 Special: $55 + Free Shipping! Use Code: AFFSOPHIS55 at checkout. Offer Expires: 12/23 at 11:59 pm. Edox, Les Vauberts Chronograph, Men's Watch, Stainless Steel Case, Leather Strap, Swiss Quartz (Battery-Powered). Buy this Edox Les Vauberts Chronograph Watch Models: 10408-3N-NIN Retail: $1,009 Special: $199 + Free Shipping! Use Code: AFFVAUBERTS199 at checkout. Offer Expires: 12/23 at 11:59 pm. Hamilton, Khaki Aviation Pilot Auto, Men's Watch, Stainless Steel Case, Leather Strap, Swiss Mechanical Automatic (Self-Winding). So buy this Hamilton Men's Khaki Aviation Pilot Auto Watch Model: H64425535 Retail: $895 Special: $399 + Free Shipping! Use Code: AFFAVIATION399 at checkout. Offer Expires: 12/23 at 11:59 pm. Rado Men's or Women's Rado True Jubile Watch . Get this Rado Men's or Women's Rado True Jubile Watch Model: R27653742, R27655742 Retail: $1,550 Special: $599 + Free Shipping! Use Code: AFFRADOTRUE599 at checkout. Offer Expires: 12/23 at 11:59 pm. Baume and Mercier, Classima Executives, Men's Watch, Stainless Steel Case, Leather Alligator Strap, Swiss Quartz (Battery-Powered). And buy this Baume and Mercier Men's Classima Executives Watch Model: MOA10144 Retail: $1,750 Special: $688 + Free Shipping! Use Code: AFFEXECUTIVE688 at checkout. Offer Expires: 12/23 at 11:59 pm. Zenith, El Primero Stratos Flyback, Men's Watch, Stainless Steel Case, Stainless Steel Bracelet, Swiss Mechanical Automatic (Self-Winding). So buy this Zenith Men's El Primero Stratos Flyback Watch Model: 03-2067-405-51-M2060 Retail: $9,200 Special: $3,995 + Free Shipping! Use Code: AFFPRIME3995 at checkout. Offer Expires: 12/23 at 11:59 pm. Calvin Klein, Feminine, Women's Watch, Stainless Steel Yellow Gold PVD Coated Case,Stainless Steel Yellow Gold PVD Coated Bracelet Bangle Type, Swiss Quartz (Battery-Powered). And buy this Calvin Klein Women's Feminine Watch Model: K2J24501 Retail: $540 Special: $88 + Free Shipping! Use Code: AFFEMININE88 at checkout. Offer Expires: 12/7 at 11:59 pm. Movado, Series 800, Men's Watch, Stainless Steel Case, Stainless Steel Bracelet, Swiss Quartz (Battery-Powered). So buy this Movado Men's Series 800 Watch Model: 2600132 Retail: $1,195 Special: $319 + Free Shipping! Use Code: AFFSERIES319 at checkout. Offer Expires: 12/7 at 11:59 pm. Rado, Original, Men's Watch, Hardmetal Yellow Gold Plated Case, Stainless Steel Yellow Gold PVD Coated Bracelet, Swiss Mechanical Automatic (Self-Winding). So buy this Rado Men's Original Watch Model: R12413013 Retail: $1,250 Special: $399 + Free Shipping! Use Code: AFFORIGINL399 at checkout. Offer Expires: 12/7 at 11:59 pm. Davidoff, Very Zino, Men's Watch, Stainless Steel Case, Rubber Strap, Swiss Mechanical Automatic (Self-Winding). And buy this Davidoff Men's Very Zino Watch Model: 20337 Retail: $2,650 Special: $448 + Free Shipping! Use Code: AFFZINO448 at checkout. Offer Expires: 12/7 at 11:59 pm. Bell and Ross, Aviation BR01 Flight Instruments, Men's Watch, Stainless Steel Black PVD Coated Case, Rubber Strap, Swiss Mechanical Automatic (Self-Winding). And buy this Bell and Ross Men's Aviation BR01 Flight Instruments Watch Model: BR01-AIRSPEED Retail: $4,900 Special: $1,858 + Free Shipping! Use Code: AFFAIRSPEED1858. Offer Expires: 12/7 at 11:59 pm. Calvin Klein, Exchange, Men's Watch, Stainless Steel Case, Leather Strap, Swiss Quartz (Battery-Powered). So buy this Calvin Klein Men's Exchange Watch Model: K2F21120 Retail: $265 Special: $75 + Free Shipping! Use code: AFFXCHANG75 at checkout. Offer Expires: 11/30 at 11:59 pm. Movado Men's or Women's Defio Watch Models: 0606333, 0606334 Retail: $995 Special: $299 + Free Shipping! Use code: AFFDEFIO299 at checkout. Offer Expires: 11/30 at 11:59 pm. Edox, Les Vauberts Day Date Automatic, Men's Watch, Stainless Steel Case, Leather Strap, Swiss Mechanical Automatic (Self-Winding). So buy this Edox Men's Les Vauberts Day Date Automatic Watch Model: 83007-3-AIN Retail: $1,300 Special: $318 + Free Shipping! Use code: AFFLESVAUB318 at checkout. Offer Expires: 11/30 at 11:59 pm. Hamilton, Khaki Field Officers Auto, Men's Watch, Stainless Steel Case, Stainless Steel Bracelet, Swiss Mechanical Automatic (Self-Winding). So buy this Hamilton Men's Khaki Field Officer Auto Watch Model: H70365133 Retail: $745 Special: $319 + Free Shipping! Use code: AFFFIELD319 at checkout. Offer Expires: 11/30 at 11:59 pm. Rado, Rado True Thinline, Women's Watch, Ceramic and Rose Gold Plated Case, Rubber Strap, Swiss Quartz (Battery-Powered). So buy this Rado Women's Rado True Thinline Watch Model: R27957709 Retail: $2,700 Special: $888 + Free Shipping! Use code: AFFTHINLINE888 at checkout. Offer Expires: 11/30 at 11:59 pm. Get 15% Off For Zenith Excludes Sale Items! Get 15% Off For Zenith Excludes Sale Items. With coupon code: AFFZEN15 at Ashford.com. Offer Expires: 11/30 at 11:59 pm. More The world�s most coveted watches, precision and reliability with stunning design. Zenith creates exotic timepieces that continue to fascinate watch aficionados worldwide. Get 15% Off For Victorinox Swiss Army Excludes Sale Items! Get 15% Off For Victorinox Swiss Army Excludes Sale Items. With coupon code: AFFVICTORX15 at Ashford.com. Offer Expires: 11/30 at 11:59 pm. More Enduring quality, classic style. These masculine watches epitomize the obsession with excellence that has driven the famous brand for over 125 years. Get 15% OFF For Seiko Excludes Sale Items! Get 15% OFF For Seiko Excludes Sale Items. With coupon code: AFFSEIKO15 at Ashford.com. Offer Expires: 11/30 at 11:59 pm. More Considered the only watch manufacturer with watchmaking expertise in every category, the Japanese company Seiko was created in 1881. Seiko was the inventor of the quartz movement, which changed the history of timekeeping as we know it. Get 15% Off For Raymond Weil Excludes Sale Items! Get 15% Off For Raymond Weil Excludes Sale Items. With coupon code: AFFRW15 at checkout. Offer Expires: 11/30 at 11:59 pm. More Exceptional quality, originality and attention to detail. Diverse and luxurious, all Raymond Weil watches offer stunning aesthetics as well as precise function. Get 18% Off For Rado Excludes Sale Items! Get 18% Off For Rado Excludes Sale Items. With coupon code: AFFRADO18 at Ashford.com. Offer Expires: 11/30 at 11:59 pm. More An exceptional team of engineers, scientists and designers with an unflappable belief in strength of technology turned a simple clockwork manufacturer into an innovative and world-class brand. Get 15% Off For Movado Excludes Sale Items! Get 15% Off For Movado Excludes Sale Items. With coupon code: AFFMOV15 at checkout. Offer Expires: 11/30 at 11:59 pm. More Bold, timeless and inspired. Movado watches offer excellent craftsmanship with stunning design, and are known for being lightweight and comfortable on the wrist. Get 15% Off For Juicy Couture Excludes Sale Items! Get 15% Off For Juicy Couture Excludes Sale Items. With coupon code: AFFJUICY15 at Ashford.com. Offer Expires: 11/30 at 11:59 pm. More Iconic fashion brand Juicy Couture brings together style, elegance, and craftsmanship to its line of trendy and accessible jewelry watches. Get 10% Off For Hamilton Excludes Sale Items! Get 10% Off For Hamilton Excludes Sale Items. With coupon code: AFFHAM10 at Ashford.com. Offer Expires: 11/30 at 11:59 pm. More Steeped in American heritage coupled with Swiss watchmaking ingenuity, Hamilton watches are the perfect blend of tradition, innovation, and elegance. Get 20% OFF on Edox Excludes Sale Items! Get 20% OFF on Edox Excludes Sale Items. With coupon code: AFFEDOX20 at Ashford. Offer Expires: 11/30 at 11:59 pm. More Since 1884, revolutionary and innovative watchmaker EDOX has been combining technical precision with horological inventiveness to create timepieces with elegance, dynamism, and performance. Get 10% Off on Coach Excludes Sale Items! Get 10% Off on Coach Excludes Sale Items. With coupon code: AFFCOACH10 at Ashford.com. Offer Expires: 11/30 at 11:59 pm. More Modern design with perfect timing, water resistance and durable luxury. Coach timepieces utilize classic style with innovative design, embodying a passion for line craftsmanship. Save 15% OFF Bulova Excludes Sale Items! Save 15% OFF Bulova Excludes Sale Items. With coupon code: AFFBUL15 at Ashford.com. Offer Expires: 11/30 at 11:59 pm. More An American icon at the cutting-edge of technology. Bulova embodies invention and creativity to make watches that are infinitely reliable and precise with Swiss movements. Get 12% Off Breitling Excludes Sale Items! Get 12% Off Breitling Watches Excludes Sale Items. With coupon code: AFFBREIT12 at checkout. Offer Expires: 11/30 at 11:59 pm. More Elegance. Performance. Precision. Breitling is a leader in the field of mechanical chronographs and has a long history partnering with the aviation history and the worlds elite pilots. Coach, Boyfriend, Women's Watch, Stainless Steel Case, Silicon Strap, Quartz (Battery-Powered). And buy this Coach Women's Boyfriend Watch Model: 14502092 Retail: $175 Special: $68 + Free Shipping! Use Code: AFFBF68 at checkout. Offer Expires: 11/28 at 11:59 pm. Calvin Klein, Dress, Women's Watch, Stainless Steel Case, Stainless Steel Bracelet Bangle Type, Swiss Quartz (Battery-Powered). So buy this Calvin Klein Women's Dress Watch Model: K3Y2M11T Retail: $440 Special: $80 + Free Shipping! Use Code: AFFDRES80 at checkout. Offer Expires: 11/28 at 11:59 pm. Hamilton, Jazzmaster Regulator, Men's Watch, Stainless Steel Case, Leather Strap, Swiss Mechanical Automatic (Self-Winding). So buy this Hamilton Men's Jazzmaster Regulator Watch Model: H42615753 Retail: $1,275 Special: $499 + Free Shipping! Use Code: AFFJAZZM499 at checkout. Offer Expires: 11/28 at 11:59 pm. Rado, Rado True Jubile, Men's Watch, Ceramic with Plasma Treatment Case, Ceramic with Plasma Treatment Bracelet, Swiss Quartz (Battery-Powered). So buy this Rado Men's Rado True Jubile Watch Model: R27654742 Retail: $1,600 Special: $599 + Free Shipping! Use Code: AFFTRUE599 at checkout. Offer Expires: 11/28 at 11:59 pm. Zenith, El Primero Stratos Flyback, Men's Watch, Stainless Steel Case, Rubber Strap, Swiss Mechanical Automatic (Self-Winding). And buy this Zenith Men's El Primero Stratos Flyback Watch Model: 03-2067-405-51-R514 Retail: $8,500 Special: $3,495 + Free Shipping! Use Code: AFFPRIME3495 at checkout. Offer Expires: 11/28 at 11:59 pm. Black Friday Sneak Peek!! 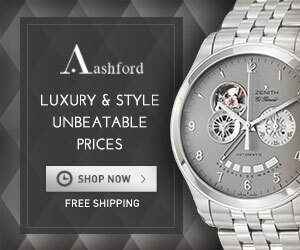 Swiss Watches at up to 90% Off + Get Free Shipping!! Limited Quantities. Shop now for best selection. No Code Needed. Calvin Klein, Skirt, Women's Watch, Stainless Steel Case, Stainless Steel Bracelet, Swiss Quartz (Battery-Powered). And buy this Calvin Klein Women's Skirt Watch Model: K2U23146 Retail: $385 Special: $88 + Free Shipping! Use Code: AFFCK88. Offer Expires: 11/25 at 11:59 pm. Movado, Luno, Men's Watch, Stainless Steel Case, Stainless Steel Bracelet, Swiss Quartz (Battery-Powered). And buy this Movado Men's Luno Watch Model: 0605557 Retail: $1,095 Special: $299 + Free Shipping! Use Code: AFFLUNO299. Offer Expires: 11/25 at 11:59 pm. Edox, Les Vauberts Automatic, Men's Watch, Stainless Steel Case, Leather Strap, Swiss Mechanical Automatic (Self-Winding). So buy this Edox Men's Les Vauberts Automatic Watch Model: 80081-3-AIN Retail: $1,050 Special: $288 + Free Shipping! Use Code: AFFLES288. Offer Expires: 11/25 at 11:59 pm. Edox, Les Vauberts Automatic, Men's Watch, Stainless Steel Case, Stainless Steel Bracelet, Swiss Mechanical Automatic (Self-Winding). And buy this Edox Men's Les Vauberts Automatic Watch Model: 85011-3B-AIN Retail: $1,525 Special: $428 + Free Shipping! Use Code: AFFVAUBERT428. Offer Expires: 11/25 at 11:59 pm. Raymond Weil, Maestro Automatic Date, Men's Watch, Stainless Steel Rose Gold PVD Coated Case, Leather Calf Skin Strap, Swiss Mechanical Automatic (Self-Winding). So buy this Raymond Weil Men's Maestro Automatic Date Watch Model: 2837-PC5-65001 Retail: $1,495 Special: $499 + Free Shipping! Use Code: AFFAUTO499. Offer Expires: 11/25 at 11:59 pm. Rado, R5.5 Chronograph, Men's Watch, Ceramic Case, Ceramic Bracelet, Swiss Quartz (Battery-Powered). So buy this Rado Men's R5.5 Chronograph Watch Model: R28885152 Retail: $2,600 Special: $599 + Free Shipping! Use Code: AFFRADO599. Offer Expires: 11/25 at 11:59 pm. Coach, Boyfriend, Women's Watch, Stainless Steel Case, Leather Strap, Japanese Quartz (Battery-Powered). So buy this Coach Women's Boyfriend Small Watch Models: 14502170 Retail: $225 Special: $89.99 + Free Shipping! Use Code: AFFBF89 at checkout. Calvin Klein, Drive, Men's Watch, Stainless Steel Case, Rubber Strap, Swiss Quartz (Battery-Powered). So buy this Calvin Klein Men's Drive Watch Model: K1V27926 Retail: $480 Special: $99.99 + Free Shipping! Use Code: AFFDRIVE99 at checkout. Rado, Original, Men's Watch, Stainless Steel Case, Stainless Steel Bracelet, Swiss Mechanical Automatic (Self-Winding). And buy this Rado Men's Original Watch Model: R12408653 Retail: $1,100 Special: $388 + Free Shipping! Use Code: AFFORIGINL388 at checkout. Hamilton, Khaki Aviation Flight Timer Quartz, Men's Watch, Stainless Steel Case, Leather Strap, Swiss Quartz (Battery-Powered). And buy this Hamilton Men's Khaki Aviation Flight Timer Quartz Watch Model: H64514551 Retail: $1,445 Special: $388 + Free Shipping! Use Code: AFFKHAKI388 at checkout. Zenith, El Primero Espada, Men's Watch, 18K Rose Gold and Stainless Steel Case, 18K Rose Gold and Stainless Steel Bracelet, Swiss Mechanical Automatic (Self-Winding). So buy this Zenith Men's El Primero Espada Watch Model: 51-2170-4650-01M2170 Retail: $11,000 Special: $4,888 + Free Shipping! Use Code: AFFPRIME4888 at checkout. Seiko, Core, Women's Watch, Stainless Steel Case, Stainless Steel Bracelet, Solar Powered Quartz. Buy this Seiko Women's Core Watch Model: SXDG13 Retail: $325 Special: $82 + Free Shipping! Use Code: AFFCORE82 at checkout. Calvin Klein, Cobblestone, Women's Watch, Stainless Steel Case, Stainless Steel Bracelet, Swiss Quartz (Battery-Powered). Buy this Calvin Klein Women's Cobblestone Watch Model: K0J23120 Retail: $295 Special: $88 + Free Shipping! Use Code: AFFCOBBLE88 at checkout. Coach, Maddy, Women's Watch, Stainless Steel Case, Stainless Steel and Yellow Gold Plated Bracelet, Japanese Quartz (Battery-Powered). And buy this Coach Women's Maddy Watch Model: 14502099 Retail: $298 Special: $119 + Free Shipping! Use Code: AFFMADDY119 at checkout. Rado, Rado True Chronograph, Men's Watch, Ceramic Case, Ceramic Bracelet, Swiss Quartz (Battery-Powered). So buy this Rado Men's Rado True Chronograph Watch Model: R27815152 Retail: $2,000 Special: $688 + Free Shipping! Use Code: AFFTRUE688 at checkout. Zenith, Captain Central Second, Men's Watch, Stainless Steel Case, Leather Alligator Over Rubber Strap, Swiss Mechanical Automatic (Self-Winding). And buy this Zenith Men's Captain Central Second Watch Model: 03-2020-670-22-C498 Retail: $5,800 Special: $2,588 + Free Shipping! Use Code: AFFCAPTAIN2588 at checkout. Seiko, Strap, Women's Watch, Stainless Steel and Rose Gold Plated Case, Leather Calf Skin Strap, Japanese Quartz (Battery-Powered). So buy this Seiko Women's Strap Watch Model: SUR871 Retail: $240 Special: $69 + Free Shipping! Use Code: AFFSTRAP69 at checkout. Calvin Klein, Exquisite, Women's Watch, Stainless Steel Yellow Gold Plated Case, Stainless Steel Gold Plated Bracelet Bangle Type, Swiss Quartz (Battery-Powered). So buy this Calvin Klein Women's Exquisite Watch Model: K1Y23209 Retail: $445 Special: $88 + Free Shipping! Use Code: AFFEXQUISITE88 at checkout. Movado Men's or Women's Defio Watch. So buy this Movado Men's or Women's Defio Watch Model: 0606333 or 0606334 Retail: $995 Special: $299 + Free Shipping! Use Code: AFFDEFIO299 at checkout. Rado, Rado True, Men's Watch, Ceramic with Plasma Treatment Case, Ceramic with Plasma Treatment Bracelet, Swiss Quartz (Battery-Powered). And buy this Rado Men's Rado True Chronograph Watch Model: R27897102 Retail: $2,100 Special: $688. Use Code: AFFTRUE688 at checkout. Plus Get Free Shipping! JeanRichard, Aeroscope, Men's Watch, Titanium DLC Coated Case, Titanium Bracelet, Swiss Mechanical Automatic (Self-Winding). So buy this JeanRichard Men's Aeroscope Watch Model: 60650-21B612-21B Retail: $6,600 Special: $1,299. Use Code: AFFAERO1299 at checkout. Plus Free Shipping! Calvin Klein Women's Embody Watch Now $88. Calvin Klein, Embody, Women's Watch, Stainless Steel Rose Gold PVD Coated Case, Leather Strap, Swiss Quartz (Battery-Powered). So buy this Calvin Klein Women's Embody Watch Model: K3C236G6 Retail: $420 Special: $88 + Free Shipping! Use code: AFFEMBODY88 at checkout. Expires: 10/7 at 11:59 pm. Bulova, Fairlawn, Women's Watch, Stainless Steel and Yellow Gold Plated Case, Stainless Steel and Yellow Gold Plated Bracelet, Quartz (Battery-Powered). And buy this Bulova Women's Fairlawn Watch Model: 98R157 Retail: $499 Special: $99.99 + Free Shipping! Use coupon code: AFFFAIR99 at checkout. Expires: 10/7 at 11:59 pm. Movado Matching Men�s and Women�s Collection Watch Model: 2100002, 2100004 Retail: $495 Special: $189 + Get Free Shipping! Use coupon code: AFFMUSEUM189 at checkout. Expires: 10/7 at 11:59 pm. Hamilton, Khaki Aviation, Men's Watch, Stainless Steel Case, Leather Strap, Swiss Mechanical Automatic (Self-Winding). And buy this Hamilton Men's Khaki Aviation Watch Model: H76665725 Retail: $795 Special: $298 + Free Shipping! Use coupon code: AFFAVIATION298 at checkout. Expires: 10/7 at 11:59 pm. Rado Matching Men's and Women�s D-Star Watch Model: R15513103, R15514103 Retail $1,395 Special $598 + Free Shipping! Use coupon code: AFFRDSTAR598 at checkout. Expires: 10/7 at 11:59 pm. Calvin Klein, Accent, Women's Watch, Stainless Steel Case, Leather Strap, Swiss Quartz (Battery-Powered). So buy this Calvin Klein Women's Accent Watch Model: K2Y2X1K6 Retail: $325 Special: $88 + Free Shipping! Use coupon code: AFFACCENT88 at checkout. Raymond Weil, Noemia, Women's Watch, Stainless Steel Case, Stainless Steel Bracelet, Swiss Quartz (Battery-Powered). So buy this Raymond Weil Women's Noemia Watch Model: 5932-ST-00995 Retail: $1,395 Special $399 + Free Shipping! use coupon code: AFFNOEMIA399 at checkout. Rado, Rado True, Men's Watch, Ceramic with Plasma Treatment Case, Ceramic with Plasma Treatment Bracelet, Swiss Mechanical Automatic (Self-Winding). And buy this Rado Men's Rado True Watch Model: R27351102 Retail: $1,600 Special $598 + Free Shipping! Use coupon code: AFFTRUE598 at checkout. Baume and Mercier, Classima Executives, Men's Watch, Stainless Steel Case, Leather Alligator Strap, Swiss Mechanical Automatic (Self-Winding). So buy this Baume and Mercier Men's Classima Executives Watch Model: MOA08589 Retail $3,150 Special $1,199 + Free Shipping! Use coupon code: AFFCLASSIMA1199 at checkout. Zenith, El Primero Stratos Flyback, Men's Watch, Stainless Steel Case, Stainless Steel Bracelet, Swiss Mechanical Automatic (Self-Winding). Buy this Zenith Men's El Primero Stratos Flyback Watch Model: 03-2067-405-51-M2060 Retail $9,200 Special $3,995. With Coupon Code: AFFPRIME3995 at checkout. Plus Get Free Shipping! Calvin Klein Women's Extent Watch. So buy this Calvin Klein Women's Extent Watch Model: K2R2L1K6 or K2R2L1C1 Retail: $265 Special: $58 + Free Shipping! Use coupon code: AFFEXTENT58 at checkout. Coach, Penny, Women's Watch, Stainless Steel Case, Stainless Steel and Leather Bracelet Bangle Type, Japanese Quartz (Battery-Powered). And buy this Coach Women's Penny Watch Model: 14501923 Retail: $248 Special: $98 + Free Shipping! Use coupon code: AFFPENNY98 at checkout. Edox, Class 1 GMT Worldtimer, Men's Watch, Stainless Steel Black PVD Coated Case, Rubber Strap, Swiss Mechanical Automatic (Self-Winding). So buy this Edox Men's Class 1 GMT Worldtimer Watch Model: 93005-37N-NRO Retail: $3,716 Special: $658 + Free Shipping! Use Coupon Code: AFFWORLD658 at checkout. Armand Nicolet, TM7 Day & Date, Men's Watch, Stainless Steel Case, Stainless Steel Bracelet, Swiss Mechanical Automatic (Self-Winding). So buy this Armand Nicolet Men's TM7 Day & Date Watch Model: 9630A-NR-M9630 Retail: $3,700 Special: $799 + Free Shipping! Use coupon code: AFFDATE799 at checkout. Rado, D-Star 200, Men's Watch, Stainless Steel and Ceramic Case, Stainless Steel Bracelet, Swiss Mechanical Automatic (Self-Winding). And buy this Rado Men's D-Star 200 Watch Model: R15966203 Retail: $2,895 Special: $1,088 + Free Shipping! Use Coupon Code: AFFDSTAR1088 at checkout. Take 40% OFF For Charmex Watch. Get 40% OFF For Charmex (Excludes sale items) Use Code: AFFCHARMX40 at checkout. So Shop Now. Seiko, Chronograph, Men's Watch, Stainless Steel Yellow Gold Plated Case, Stainless Steel Yellow Gold Plated Bracelet, Japanese Quartz (Battery-Powered). So buy this Seiko Men's Chronograph Watch Model: SKS426 Retail: $280 Special: $72 + Free Shipping! Use Code: AFFCHRONO72 at checkout. Calvin Klein, Drive, Men's Watch, Stainless Steel Case, Rubber Strap, Swiss Quartz (Battery-Powered). Buy this Calvin Klein Men's Drive Watch Model: K1V27704 Retail: $480 Special: $108 + Free Shipping! Use Code: AFFDRIVE108 at checkout. Hamilton, Khaki Field Officers Auto, Men's Watch, Stainless Steel Case, Stainless Steel Bracelet, Swiss Mechanical Automatic (Self-Winding). And buy this Hamilton Men's Khaki Field Officer Auto Watch Model: H70365133 Retail: $745 Special: $328 + Free Shipping! Use Code: AFFKHAKI328 at checkout. Rado, R5.5 Jubile, Men's Watch, Ceramic Case, Ceramic Bracelet, Swiss Quartz (Battery-Powered). So buy this Rado Men's R5.5 Jubile Watch Model: R28910702 Retail: $2,800 Special: $778 + Free Shipping! Use Code: AFFRADO778 at checkout. Zenith, Captain Chronograph, Men's Watch, Stainless Steel Case, Leather Alligator Over Rubber Strap, Swiss Mechanical Automatic (Self-Winding). And buy this Zenith Men's Captain Chronograph Watch Model: 03-2110-400-01-C498 Retail $8,300 Special $3,895. Plus Get Free Shipping! Use Code: AFFZEN3895 at checkout. Calvin Klein, Sophistication, Women's Watch, Stainless Steel Yellow Gold Plated Case, Leather Strap, Swiss Quartz (Battery-Powered). And buy this Calvin Klein Women's Sophistication Watch Model: K1B23609 Retail $400 Special $78 + Free CK Charm - retail value $50! Free Shipping! Use Code: AFFSOPHISGIFT at checkout. Edox, Les Vauberts Chronograph, Men's Watch, Stainless Steel Case, Stainless Steel Bracelet, Swiss Quartz (Battery-Powered). So buy this Edox Men's Les Vauberts Chronograph Watch Model: 10409-3N-NIN Retail $1,245 Special $238 + Free Shipping! Use Code: AFFVAUBERT238 at checkout. Rado D-Star men's watch. Ceramos case on a stainless steel bracelet. Ceramos� is made of high-tech ceramic and a metal composite that was designed to have the optimal properties of both components. A unique platinum steel look and lightweight material makes it ideal for sharp and edgy designs. Buy this Rado Men's D-Star Watch Model: R15937153 Retail $1,695 Special $588 + Free Shipping. Use Code: AFFDSTAR588 at checkout. Raymond Weil, Maestro Automatic Open Balance Wheel, Women's Watch, Stainless Steel Case, Stainless Steel Bracelet, Swiss Mechanical Automatic (Self-Winding). So buy this Raymond Weil Women's Maestro Automatic Open Balance Wheel Watch Model: 2627-ST-00994 Retail $2,295 Special $718 + Free Shipping! Use Code: AFFWHEEL718 at checkout. Hamilton, American Classic Railroad Petite Seconde, Men's Watch, Stainless Steel Yellow Gold PVD Coated Case, Leather Strap, Swiss Mechanical Automatic (Self-Winding). So buy this Hamilton Men's American Classic Railroad Petite Seconde Watch Model: H40645555 Retail $1,595 Special $678 + Free Shipping! Use Code: AFFCLASSIC678 at checkout. Seiko, Chronograph, Men's Watch, Stainless Steel and Yellow Gold Plated Case, Stainless Steel and Yellow Gold Plated Bracelet, Japanese Quartz (Battery-Powered). So buy this Seiko Men's Chronograph Watch Code: AFFCHRONO76 Model: SKS432 Retail: $280 Special: $72 + Free Shipping! Use Coupon Code: AFFCHRONO72 at checkout. Calvin Klein, Window, Men's Watch, Stainless Steel Case, Leather Strap, Swiss Quartz (Battery-Powered). And buy this Calvin Klein Men's Window Watch Model: K2M21126 Retail: $355 Special: $78 + Free Shipping! Use coupon code: AFFWINDOW78 at checkout. Coach, Maddy, Women's Watch, Stainless Steel Case, Stainless Steel Bracelet, Japanese Quartz (Battery-Powered). And buy this Coach Women's Maddy Watch Model: 14501791 Retail $248 Special $99 + Free Shipping! Use Coupon Code: AFFMADDY99 at checkout. Movado Men's & Women's Museum Watch. So buy this Movado Men's & Women's Museum Watch Model: 2100002 or 2100004 Retail $495 Special $189. With Coupon Code: AFFMUSEUM189 at checkout. Plus Get Free Shipping! Hamilton, Khaki Aviation Pilot Auto, Men's Watch, Stainless Steel Case, Leather Strap, Swiss Mechanical Automatic (Self-Winding). So buy this Hamilton Men's Khaki Aviation Pilot Auto Watch Model: H64425585 Retail $895 Special $399. Use coupon code: AFFPILOT399 at checkout. Plus Get Free Shipping! Rado, D-Star, Men's Watch, Stainless Steel Case, Stainless Steel Bracelet, Swiss Mechanical Automatic (Self-Winding). So buy this Rado Men's D-Star Watch Model: R15513113 Retail $1,395 Special $628. With Coupon Code: AFFDSTAR628 at checkout. Plus Get Free Shipping! Seiko, Chronograph, Men's Watch, Stainless Steel Black Ion Plated Case, Stainless Steel Black Ion Plated Bracelet, Japanese Quartz (Battery-Powered). So buy this Seiko Men's Chronograph Watch Model: SKS437 Retail $305 Special $82 + Free Shipping! Use coupon code: AFFCHRONO82 at checkout. Bulova, Classic, Men's Watch, Stainless Steel and Yellow Gold Plated Case, Stainless Steel and Yellow Gold Plated Bracelet, Japanese Quartz (Battery-Powered). So buy this Bulova Men's Classic Watch Model: 98B214 Retail: $350 Special: $98 + Free Shipping! Use coupon code: AFFCLASSIC98 at checkout. Calvin Klein, Enlace, Women's Watch, Stainless Steel Yellow Gold PVD Coated Case, Stainless Steel Yellow Gold PVD Coated Bracelet Bangle Type, Swiss Quartz (Battery-Powered). So buy this Calvin Klein Women's Enlace Watch Model: K2L24509 Retail: $445 Special: $98 + Free CK Charm - Retail Value $50!! Use coupon code: AFFENLACE98 at checkout. Rado, Sintra Jubile, Men's Watch, Ceramic Case, Ceramic Bracelet, Swiss Quartz (Battery-Powered). So buy this Rado Men's Sintra Jubile Watch Model: R13724712 Retail: $2,700 Special: $828 + Free Shipping! Use coupon code: AFFSINTRA828 at checkout. Raymond Weil, Maestro Automatic Open Balance Wheel, Women's Watch, Stainless Steel Case, Stainless Steel Bracelet, Swiss Mechanical Automatic (Self-Winding). So buy this Raymond Weil Women's Maestro Automatic Open Balance Wheel Watch Model: 2627-STS-00965 Retail $3,350 Special $1,088. Use Coupon Code: AFFWHEEL1088 at checkout. Plus Get Free Shipping! Calvin Klein, Fly, Women's Watch, Stainless Steel Case,Stainless Steel Bracelet Bangle Type, Swiss Quartz (Battery-Powered). So buy this Calvin Klein Women's Fly Watch Model: K9923120 Retail $285 Special $58 + FREE CK Charm - Retail Value $50! Use Code: AFFFLYGIFT58 at checkout. Hamilton, Khaki Aviation, Men's Watch, Stainless Steel Case, Leather Strap, Swiss Mechanical Automatic (Self-Winding). So buy this Hamilton Men's Khaki Aviation Watch Model: H76665835 Retail $795 Special $318 + Free Shipping! Use Code: AFFAVIATN318 at checkout. Edox, Les Bemonts Ultra Slim Hand Winding, Men's Watch, Stainless Steel Case, Leather Strap, Swiss Mechanical Manual (Hand-Winding). So buy this Edox Men's Les Bemonts Ultra Slim Handwinding Watch Model: 72014-3-AIN Retail $1,719 Special $399 + Free Shipping! Use Code: AFFBEMONTS399 at checkout. Rado, D-Star 200, Men's Watch, Stainless Steel and Ceramic Case, Rubber Strap, Swiss Mechanical Automatic (Self-Winding). So buy this Rado Men's D-Star 200 Watch Model: R15965159 Retail $2,795 Special $988 + Free Shipping! Use Code: AFFSTAR988 at checkout. Raymond Weil, Jasmine, Women's Watch, Stainless Steel and Rose Gold Plated PVD Coated Case, Stainless Steel and PVD Coating Bracelet, Swiss Mechanical Automatic (Self-Winding). So buy this Raymond Weil Women's Jasmine Watch Model: 2629-S5-01659 Retail $2,450 Special $679. With Coupon Code: AFFJASMINE679 at checkout. Plus Get Free Shipping! Seiko, Dress, Men's Watch, Stainless Steel Case, Leather Calf Skin Strap, Japanese Quartz (Battery-Powered). So buy this Seiko Men's Dress Watch Model: SUR075 Retail $200 Special $55 + Free Shipping! Use coupon code: AFFDRESS55 at checkout. Bulova, Marine Star Solano, Women's Watch, Stainless Steel Case, Stainless Steel Bracelet, Quartz (Battery-Powered). So buy this Bulova Women's Solano Watch Model: 96L145 Retail: $399 Special: $80 + Free Shipping! Use coupon code: AFFMARINE80 at checkout. Calvin Klein, Drive, Men's Watch, Stainless Steel Case, Rubber Strap, Swiss Quartz (Battery-Powered). So buy this Calvin Klein Men's Drive Watch Model: K1V27926 Retail $480 Special $99.99 + Free Shipping! Use coupon code: AFFDRIVE99 at checkout. Movado, Concerto, Women's Watch, Stainless Steel Case, Stainless Steel Bracelet, Swiss Quartz (Battery-Powered). Buy this Movado Women's Concerto Watch Model: 0606702 Retail: $995 Special: $299 + Free Shipping. Use coupon code: AFFCONCERT299 at checkout. Rado D-Star men's watch. Ceramos case on a stainless steel bracelet. Ceramos� is made of high-tech ceramic and a metal composite that was designed to have the optimal properties of both components. A unique platinum steel look and lightweight material makes it ideal for sharp and edgy designs. Buy this Rado Men's D-Star Watch Model: R15946153 Retail $1,695 Special $648 + Free Shipping. Use coupon code: AFFDSTAR648 at checkout. Calvin Klein, Air, Women's Watch, Stainless Steel Case,Stainless Steel Bracelet Bangle Type, Swiss Quartz (Battery-Powered). So buy this Calvin Klein Women's Air Watch Model: K1N23102 Retail: $290 Special: $75 + Free Shipping! Use Code: AFFCKAIR75 at checkout. Coach, Maddy, Women's Watch, Stainless Steel Yellow Gold Ion Plated Case, Leather Calf Skin Strap, Japanese Quartz (Battery-Powered). And buy this Coach Women's Maddy Watch Model: 14501799 Retail: $228 Special: $98 + Free Shipping! Use Code: AFFMADDY98 at checkout. Hamilton, Pulsomatic, Men's Watch, Stainless Steel Black PVD Coated Case, Rubber Strap, Swiss Mechanical Automatic (Self-Winding). Buy this Hamilton Men's Pulsomatic Watch Model: H52585339 Retail $1,645 Special $399 + Free Shipping! Use Code: AFFPULSO399 at checkout. Rado, D-Star Chronograph, Men's Watch, Ceramic Case, Ceramic Bracelet, Swiss Mechanical Automatic (Self-Winding). So buy this Rado Men's D-Star Chronograph Watch Model: R15200152 Retail $3,800 Special $1,295 + Free Shipping! Use Code: AFFSTAR1295 at checkout. Zenith, El Primero Stratos Flyback, Men's Watch, Stainless Steel Case, Rubber Strap, Swiss Mechanical Automatic (Self-Winding). So buy this Zenith Men's El Primero Stratos Flyback Watch Model: 03-2067-405-51-R514 Retail $8,500 Special $3,695 + Free Shipping! Use Code: AFFPRIME3695 at checkout. Bulova, Classic, Women's Watch, Stainless Steel and Rose Gold Plated Case, Stainless Steel and Rose Gold Plated Bracelet, Japanese Quartz (Battery-Powered). So buy this Bulova Women's Classic Watch Model: 98L195 Retail $299 Special $79. With coupon code: AFFCLASSIC79 at checkout. Plus Get Free Shipping! Calvin Klein, Gentle, Men's Watch, Stainless Steel Case, Stainless Steel Bracelet, Swiss Quartz (Battery-Powered). And buy this Calvin Klein Men's Gentle Watch Model: K3L31166 Retail $380 Special $98. With coupon code: AFFGENTLE98 at checkout. Plus Get Free Shipping! U-Boat, Left Hook IFO, Men's Watch, Stainless Steel Black Ion Plated Case, Leather Strap, Quartz (Battery-Powered). And buy this U-Boat Men's Left Hook IFO Watch Model: 7248 Retail $2,250 Special $429. With coupon code: AFFHOOK429 at checkout. Plus Get Free Shipping! Hamilton, Khaki Aviation QNE, Men's Watch, Stainless Steel Case, Stainless Steel Bracelet, Swiss Mechanical Automatic (Self-Winding). And buy this Hamilton Men's Khaki Aviation QNE Watch Model: H76655123 Retail $1,245 Deal Price $458. With coupon code: AFFQNE458 at checkout. Plus Get Free Shipping! Rado, D-Star 200, Men's Watch, Stainless Steel Case, Rubber Strap, Swiss Mechanical Automatic (Self-Winding). So buy this Rado Men's D-Star 200 Watch Model: R15959159 Retail 1,695 Special $599. With coupon code: AFFDSTAR599 at checkout. Plus Get Free Shipping! Seiko, Strap, Women's Watch, Stainless Steel and Rose Gold Plated Case, Leather Calf Skin Strap, Japanese Quartz (Battery-Powered). So buy this Seiko Women's Strap Watch Model: SUR871 Retail: $240 Special: $69. Use coupon code: AFFSTRAP69 at checkout. Plus Get Free Shipping! Edox, Les Vauberts Chronograph, Men's Watch, Stainless Steel Case, Leather Strap, Swiss Quartz (Battery-Powered). So buy this Edox Men's Les Vauberts Chronograph Watch Model: 10408-3A-AIN Retail $834 Special $249. With coupon code: AFFLES249 at checkout. Plus Get Free Shipping! Bulova Accutron, Mirador, Women's Watch, Stainless Steel and Ceramic Case, Stainless Steel and Ceramic Bracelet, Swiss Quartz (Battery-Powered). So buy this Bulova Accutron Women's Mirador Watch Model: 65R137 Retail $1,795 Special $359. With coupon code: AFFMIRADOR359 at checkout. Plus Get Free Shipping. Hamilton, Timeless Classic Thin-O-Matic Auto, Men's Watch, Stainless Steel Yellow Gold Plated Case, Stainless Steel Yellow Gold Plated Bracelet Expandable Type, Swiss Mechanical Automatic (Self-Winding). And buy this Hamilton Men's Timeless Classic Thin-O-Matic Auto Watch Model: H38435221 Retail $975 Special $388. With coupon code: AFFCLASSIC388 at checkout. Plus Get Free Shipping! Rado, Sintra Automatic, Men's Watch, Ceramic Case, Ceramic Bracelet, Swiss Mechanical Automatic (Self-Winding). So buy this Rado Men's Sintra Automatic Watch Model: R13691172 Retail $2,800 Special $868. With coupon code: AFFSINTRA868 at cehckout. Plus Get Free Shipping! Seiko, Kinetic, Men's Watch, Stainless Steel and Rose Gold Plated Case, Stainless Steel Bracelet, Kinetic Powered/Autoquartz. And buy this Seiko Men's Kinetic Watch Model: SKA661 Retail: $340 Special: $88. With coupon code: AFFKINETIC88 at checkout. Plus Get Free Shipping. Hamilton, Khaki Navy Frogman, Men's Watch, Titanium Case, Rubber Strap, Swiss Mechanical Automatic (Self-Winding). And buy this Hamilton Men's Khaki Navy Frogman Watch Model: H77746333 Retail: $1,595 Special: $598. With coupon code: AFFNAVY598 at checkout. Plus Get Free Shipping. Concord, Saratoga, Men's Watch, Stainless Steel Black PVD Coated Case, Stainless Steel and Rubber Bracelet, Swiss Quartz (Battery-Powered). So buy this Concord Men's Saratoga Watch Model: 0311818 Retail: $2,990 Special: $695. With coupon code: AFFSARATOGA695 at checkout. Plus Get Free Shipping! Rado, D-Star 200, Men's Watch, Stainless Steel and Ceramic Case, Stainless Steel Bracelet, Swiss Mechanical Automatic (Self-Winding). So buy this Rado Men's D-Star 200 Watch Model: R15959103 Retail: $1,795 Special: $839. With coupon code: AFFSTAR839 at checkout. Plus Get Free Shipping! Armand Nicolet, S05, Men's Watch, Titanium Case, Rubber Strap, Swiss Mechanical Automatic (Self-Winding). So buy this Armand Nicolet Men's S05 Watch Model: T610AGN-AG-G9610 Retail $4,400 Special $880. With coupon code: AFFARM880 at checkout. Plus Get Free Shipping! Raymond Weil, Maestro Automatic Date, Men's Watch, Stainless Steel Yellow Gold PVD Coated Case, Leather Calf Skin Strap, Swiss Mechanical Automatic (Self-Winding). So buy this Raymond Weil Men's Maestro Automatic Date Watch Model: 2837-PC-50001 Retail $1,495 Special $499. With coupon code: AFFMAESTRO499 at checkout. Plus Get Free Shipping! Rado, Coupole L, Men's Watch, Stainless Steel Case, Stainless Steel Bracelet, Swiss Quartz (Battery-Powered). So buy this Rado Men's Coupole L Watch Model: R22852163 Retail $1,300 Special $499. With coupon code: AFFCOUPOLE499 at checkout. Plus Get Free Shipping! Baume and Mercier, Classima Executives, Men's Watch, Stainless Steel Case, Leather Alligator Strap, Swiss Quartz (Battery-Powered). So buy this Baume and Mercier Men's Classima Executives Watch Model: MOA10098 Retail $1,750 Special $688. With coupon code: AFFCLASS688 at checkout. Plus Get Free Shipping! Hamilton, American Classic Railroad Petite Seconde, Men's Watch, Stainless Steel Yellow Gold PVD Coated Case, Leather Strap, Swiss Mechanical Automatic (Self-Winding). So buy this Hamilton Men's American Classic Railroad Petite Seconde Watch Model: H40645555 Retail $1,595 Special $729. With coupon code: AFFCLASSIC729 at checkout. Plus Get Free Shipping! Zenith, Captain Central Second, Men's Watch, Stainless Steel Case, Leather Alligator Over Rubber Strap, Swiss Mechanical Automatic (Self-Winding). And buy this Zenith Men's Captain Central Second Watch Model: 03-2020-670-21-C493 Retail $5,800 Special $2,999. With coupon code: AFFCAPTAIN2999 at checkout. Plus Get Free Shipping! Seiko, Chronograph, Men's Watch, Stainless Steel and Yellow Gold Plated Case, Stainless Steel and Yellow Gold Plated Bracelet, Japanese Quartz (Battery-Powered). So buy this Seiko Men's Chronograph Watch Model: SKS432 Retail $280 Special $76. With coupon code: AFFCHRONO76 at checkout. Plus Get Free Shipping! Edox, Les Vauberts Chronograph, Men's Watch, Stainless Steel Case, Stainless Steel Bracelet, Swiss Quartz (Battery-Powered). So buy this Edox Men's Les Vauberts Chronograph Watch Model: 10409-3N-NIN Retail $1,245 Special $249. With coupon code: AFFVAUBERT249 at checkout. Plus Get Free Shipping! Movado, Series 800, Men's Watch, Stainless Steel Black PVD Coated Case, Leather Calf Skin Strap, Swiss Quartz (Battery-Powered). So buy this Movado Men's Series 800 Watch Model: 2600118 Retail $1,795 Special $499. With coupon code: AFFSERIES499 at checkout. Plus Get Free Shipping! Hamilton, Khaki Field Pioneer Auto Chrono, Men's Watch, Stainless Steel Case, Leather Strap, Swiss Mechanical Automatic (Self-Winding). So buy this Hamilton Men's Khaki Field Pioneer Auto Chrono Watch Model: H60416583 Retail $1,945 Special $758. With coupon code: AFFFIELD758 at checkout. Plus Get Free Shipping! Rado, D-Star 200, Men's Watch, Stainless Steel and Ceramic Case, Stainless Steel Bracelet, Swiss Mechanical Automatic (Self-Winding). So buy this Rado Men's D-Star 200 Watch Model: R15966203 Retail: $2,895 Special: $1,158. With Coupon Code: AFFDSTAR1158 at checkout. Plus Get Free Shipping! Calvin Klein, Dart, Men's Watch, Stainless Steel Case, Rubber Strap, Swiss Quartz (Battery-Powered). So buy this Calvin Klein Men's Dart Watch Model: K2S371VN Retail: $495 Special: $138. With coupon code: AFFDART138 at checkout. Plus Get Free Shipping! Movado, Corporate Exclusive, Men's Watch, Stainless Steel Case, Stainless Steel Bracelet, Swiss Quartz (Battery-Powered). So buy this Movado Men's Corporate Exclusive Watch Model: 0606276 Retail: $995 Special: $289 + Free Shipping! Use coupon code: AFFCORP289 at checkout. Raymond Weil, Maestro Automatic Small Second, Men's Watch, Stainless Steel Rose Gold PVD Coated Case, Leather Strap, Swiss Mechanical Automatic (Self-Winding). And buy this Raymond Weil Men's Maestro Automatic Small Second Watch Model: 2838-PC5-00209 Retail $1,595 Special $518. Use coupon code: AFFMAESTRO518 at checkout. Plus Get Free Shipping! Rado Integral men's watch. Stainless steel case on a stainless steel and ceramos bracelet. Ceramos� is made of high-tech ceramic and a metal composite that was designed to have the optimal properties of both components. A unique platinum steel look and lightweight material makes it ideal for sharp and edgy designs. So buy this Rado Men's Integral Automatic Watch Model: R20693102 Retail $2,200 Special $668. With Coupon Code: AFFINTEG668 at checkout. Plus Get Free Shipping. Hamilton, Khaki Aviation X-Patrol Auto Chrono, Men's Watch, Stainless Steel Case, Leather Strap, Swiss Mechanical Automatic (Self-Winding). And buy this Hamilton Men's Khaki Aviation X-Patrol Auto Chrono Watch Model: H76566751 Retail $1,695 Special $758. With Coupon Code: AFFKHAKI758 at checkout. Plus Get Free Shipping! Calvin Klein, Window, Men's Watch, Stainless Steel Case, Leather Strap, Swiss Quartz (Battery-Powered). So buy this Calvin Klein Men's Window Watch Model: K2M21126 Retail $355 Special $88. With coupon code: AFFWINDOW88 at checkout. Plus Get Free Shipping. Bulova, Marine Star, Men's Watch, Black Stainless Steel Case, Polyurethane Strap, Japanese Quartz (Battery-Powered). And get this Bulova Men's Marine Star Watch Model: 98B164 Retail $450 Special $112. Use coupon code: AFFMARINE112 at checkout. Plus Get Free Shipping. Hamilton, Khaki Aviation Auto, Men's Watch, Stainless Steel Case, Leather Strap, Swiss Mechanical Automatic (Self-Winding). And buy this Hamilton Men's Khaki Aviation Watch Model: H76565835 Retail $745 Special $298. With coupon code: AFFKHAKI298 at checkout. Plus Get Free Shipping. Movado, Concerto, Men's Watch, Stainless Steel Case, Stainless Steel and Yellow Gold Plated Bracelet, Swiss Quartz (Battery-Powered). Get this Movado Men's Concerto Watch Model: 0606588 Retail $1,295 Special $379. With coupon code: AFFCONCERT379 at checkout. Plus Get Free Shipping. Rado, Coupole L, Men's Watch, Stainless Steel Case, Stainless Steel Bracelet, Swiss Quartz (Battery-Powered). So buy this Rado Men's Coupole L Watch Model: R22852153 Retail $1,300 Special $499 + Free Shipping! Use Code: AFFCOUPOL499 at checkout. Calvin Klein, Dart, Men's Watch, Stainless Steel Case, Rubber Strap, Swiss Quartz (Battery-Powered). And buy this Calvin Klein Men's Dart Watch Model: K2S371D6 Retail $495 Special $99.99. With coupon code: AFFDART99 at checkout. Plus Get Free Shipping! Bulova, Marine Star, Men's Watch, Stainless Steel Case, Stainless Steel Bracelet, Japanese Quartz (Battery-Powered). So buy this Bulova Men's Marine Star Watch Model: 98B205 Retail: $499 Special: $109. With coupon code: AFFSTAR109 at checkout. Plus Get Free Shipping! Hamilton, Khaki Aviation QNE, Men's Watch, Stainless Steel Case, Leather Strap, Swiss Mechanical Automatic (Self-Winding). So buy this Hamilton Men's Khaki Aviation QNE Watch Model: H76655733 Retail $1,195 Special $458. With coupon code: AFFAVIATION458 at checkout. Plus Get Free Shipping! Armand Nicolet, TM7 Day & Date, Men's Watch, Stainless Steel Case, Stainless Steel Bracelet, Swiss Mechanical Automatic (Self-Winding). And buy this Armand Nicolet Men's TM7 Day & Date Watch Model: 9630A-AG-M9630 Retail $3,700 Special $799. With coupon code: AFFDAY799 at checkout. Plus Get Free Shipping! Rado, D-Star 200, Men's Watch, Stainless Steel and Ceramic Case, Stainless Steel Bracelet, Swiss Mechanical Automatic (Self-Winding). Buy this Rado Men's D-Star 200 Watch Model: R15965103 Retail $2,895 Special $1,095. WIth coupon code: AFFDSTAR1095 at checkout. Plus Get Free Shipping! Calvin Klein, Conversion, Men's Watch, Stainless Steel Case, Leather Strap, Swiss Quartz (Battery-Powered). And buy this Calvin Klein Men's Conversion Watch Model: K9712102 Retail $325 Special $65 + FREE CK Charm - Retail $50!! Use Code: AFFCONVGIFT at checkout. Bulova, Crystal, Men's Watch, Stainless Steel and Crystals Case, Stainless Steel and Crystals Bracelet, Quartz (Battery-Powered). And buy this Bulova Men's Crystal Watch Model: 96C108 Retail $599 Special $119. Use coupon code: AFFCRYSTAL119 at checkout. Plus Get Free Shipping! Rado, Coupole L, Men's Watch, Stainless Steel and Rose Gold Plated PVD Coated Case, Stainless Steel and PVD Coating Bracelet, Swiss Quartz (Battery-Powered). And buy this Rado Men's Coupole L Watch Model: R22852173 Retail: $1,350 Special: $499. With coupon code: AFFCOUPOLE499 at checkout. Plus Get Free Shipping! Raymond Weil, Maestro Automatic Date, Men's Watch, Stainless Steel Rose Gold PVD Coated Case, Leather Calf Skin Strap, Swiss Mechanical Automatic (Self-Winding). And buy this Raymond Weil Men's Maestro Automatic Date Watch Model: 2837-PC5-65001 Retail $1,495 Special $499. With coupon code: AFFMAESTRO499 at checkout. Plus Get Free Shipping! Edox, Chronorally Automatic, Men's Watch, Stainless Steel Black PVD Coated Case, Rubber Strap, Swiss Mechanical Automatic (Self-Winding). So buy this Edox Men's Chronorally Automatic Watch Model: 01116-37NPN-GIN Retail $5,050 Special $858. With coupon code: AFFCHRONO858 at checkout. Plus Get Free Shipping! Calvin Klein, Basic, Men's Watch, Stainless Steel Case, Leather Strap, Swiss Quartz (Battery-Powered). And buy this Calvin Klein Men's Basic Watch Model: K2A27102 Retail $425 Special $88. With coupon code: AFFCKBASIC88 at checkout. Plus Get Free Shipping. Bulova, Precisionist Longwood, Men's Watch, Stainless Steel Case, Stainless Steel Bracelet, Japanese Quartz (Battery-Powered). So buy this Bulova Men's Precisionist Longwood Watch Model 96B130 Retail $450 Special $119. With coupon code: AFFLONG119 at checkout. Plus Get Free Shipping! Edox, Les Vauberts Chronograph, Men's Watch, Stainless Steel Case, Stainless Steel Bracelet, Swiss Quartz (Battery-Powered). And buy this Edox Men's Les Vauberts Chronograph Watch Model: 10409-3N-NIN Retail $1,029 Special $268. With coupon code: AFFVAUBERT268 at checkout. Plus Get Free Shipping! Hamilton, Khaki Aviation QNE, Men's Watch, Stainless Steel Case, Leather Strap, Swiss Mechanical Automatic (Self-Winding). And buy this Hamilton Men's Khaki Aviation QNE Watch Model: H76655723 Retail $1,195 Special $458. With coupon code: AFFAVIATN458 at checkout. Plus Get Free Shipping! Rado, Rado True Chronograph, Men's Watch, Ceramic Case, Ceramic Bracelet, Swiss Quartz (Battery-Powered). And buy this Rado Men's Rado True Chronograph Watch Model: R27815152 Retail $2,000 Special $698. With coupon code: AFFTRUE698 at checkout. Plus Get Free Shipping! Bulova, Bracelet, Women's Watch, Stainless Steel Case, Stainless Steel and Yellow Gold Plated Bracelet, Japanese Quartz (Battery-Powered). And buy this Bulova Women's Bracelet Watch Model: 98L166 Retail $350 Special $88. With coupon code: AFFBCLT88 at checkout. Plus Get Free Shipping! Calvin Klein, Cogent, Men's Watch, Stainless Steel Case, Leather Strap, Swiss Quartz (Battery-Powered). And buy this Calvin Klein Men's Cogent Watch Model: K3B2T1C1 Retail $445 Special $118 + Free leather necklace - Retail Value $25 Use Code: AFFCOGENTGIFT at checkout. Bulova Accutron, Pemberton, Women's Watch, Stainless Steel Case, Stainless Steel Bracelet, Swiss Quartz (Battery-Powered). And buy this Bulova Accutron Women's Pemberton Watch Model: 63R138 Retail $1,595 Special $258. With coupon code: AFFPEMBER258 at checkout. Plus Get Free Shipping. Rado, Rado True, Men's Watch, Ceramic Case, Ceramic Bracelet, Swiss Quartz (Battery-Powered). And buy this Rado Men's Rado True Watch Model: R27653062 Retail $1,200 Special $488. With Coupon Code: AFFRTRUE488 at checkout. Plus Get Free Shipping! Edox, Class 1 GMT Worldtimer, Men's Watch, Stainless Steel Case, Rubber Strap, Swiss Mechanical Automatic (Self-Winding). And buy this Edox Men's Class 1 GMT Worldtimer Watch Model: 93005-3-NBUR Retail $3,492 Special $698. With Coupon Code: AFFCLASS698 at checkout. Plus Get Free Shipping! Coach, Lexington, Women's Watch, Stainless Steel Yellow Gold Ion Plated Case, Leather Strap, Quartz (Battery-Powered). And buy this Coach Women's Lexington Watch Model: 14501898 Retail $248 Special $105. With coupon code: AFFLEXI105 at checkout. Plus Get Free Shipping! Movado, Amorosa, Women's Watch, Stainless Steel and Diamonds Case, Stainless Steel Bracelet, Swiss Quartz (Battery-Powered). And buy this Movado Women's Amorosa Watch Model: 0606813 Retail $995 Special $299. With coupon code: AFFJUBILE299 at checkout. Plus Get Free Shipping! Hamilton, Khaki Aviation QNE, Men's Watch, Stainless Steel Case, Stainless Steel Bracelet, Swiss Mechanical Automatic (Self-Winding). And buy this Hamilton Men's Khaki Aviation QNE Watch Model: H76655133 Retail $1,245 Special $475. With coupon code: AFFKHAKI475 at checkout. Plus Get Free Shipping. Rado, Rado True Jubile, Women's Watch, Ceramic Case, Ceramic Bracelet, Swiss Quartz (Battery-Powered). And buy this Rado Women's Rado True Jubile Watch Model: R27696712 Retail $1,500 Special $618. With coupon code: AFFRTRUE618 at checkout. Plus Get Free Shipping! Armand Nicolet, M02, Men's Watch, Stainless Steel Case, Stainless Steel Bracelet, Swiss Mechanical Automatic (Self-Winding). And buy this Armand Nicolet Men's M02 Complete Calendar Watch Model: 9642B-2-AG-M9140 Retail $6,000 Special $1,588. With coupon code: AFFANMO1588 at checkout. Mother's Day - Find the perfect gift for Mom! We have a huge selection of fine watches and jewelry for up to 90% off + Free Shipping!! Buy Now. Bulova, Marine Star Solano, Women's Watch, Stainless Steel Case, Stainless Steel Bracelet, Quartz (Battery-Powered). And buy this Bulova Women's Solano Watch Model: 96L145 Retail: $399 Special: $79.99. With coupon code: AFFMARINE79 at checkout. Plus Get Free Shipping. Calvin Klein, Delight, Women's Watch, Stainless Steel Case,Stainless Steel Bracelet Bangle Type, Swiss Quartz (Battery-Powered). And buy this Calvin Klein Women's Delight Watch Model: K1A24806 Retail $295 Special $88. With coupon code: AFFDLIGHT88 at checkout. Plus Get Free Shipping! Seiko, Kinetic, Men's Watch, Stainless Steel and Rose Gold Plated Case, Stainless Steel Bracelet, Kinetic Powered/Autoquartz. And buy this Seiko Men's Kinetic Watch Model: SKA661 Retail $340 Special $98. With coupon code: AFFKINETIC98 at checkout. Plus Get Free Shipping! Hamilton, Khaki Navy Frogman, Men's Watch, Titanium Case, Rubber Strap, Swiss Mechanical Automatic (Self-Winding). And buy this Hamilton Men's Khaki Navy Frogman Watch Model: H77746333 Retail $1,595 Special $598. With coupon code: AFFNAVY598 at checkout. Plus Get Free Shipping! Rado, Rado True Chronograph, Men's Watch, Ceramic Case, Ceramic Bracelet, Swiss Quartz (Battery-Powered). So buy this Rado Men's Rado True Chronograph Watch Model: R27814172 Retail $2,100 Special $728. With coupon code: AFFTRUE728 at checkout. Plus Get Free Shipping! Relic by Fossil, Payton Micro, Women's Watch, Plastic Case, Plastic Bracelet, Japanese Quartz (Battery-Powered). And buy this Relic by Fossil Women's Payton Micro Watch Model: ZR34268 Retail $90 Special $24 + Free Shipping! Use coupon code: AFFPAYTON24 at checkout. Bulova, Fairlawn, Women's Watch, Stainless Steel and Yellow Gold Plated Case, Stainless Steel and Yellow Gold Plated Bracelet, Quartz (Battery-Powered). So buy this Bulova Women's Fairlawn Watch Model: 98R157 Retail $499 Special $99.99. With coupon code: AFFFAIR99 at checkout. Plus Get Free Shipping. Calvin Klein, Basic, Men's Watch, Stainless Steel Case, Stainless Steel Bracelet, Swiss Quartz (Battery-Powered). Buy this Calvin Klein Men's Basic Watch Model K2A27104 Retail $445 Special $99.99 + Free Shipping + FREE Fossil Necklace. Retail $25!! Use Code: AFFBASICGIFT99 at checkout. Hamilton, Khaki Aviation, Men's Watch, Stainless Steel Case, Leather Strap, Swiss Mechanical Automatic (Self-Winding). And buy this Hamilton Men's Khaki Aviation Watch Model: H76665725 Retail $795 Special $318. With coupon code: AFFAVIATION318 at checkout. Plus Get Free Shipping. Rado, Rado True Thinline, Women's Watch, Ceramic and Rose Gold Plated Case, Rubber Strap, Swiss Quartz (Battery-Powered). So buy this Rado Women's Rado True Thinline Watch Model: R27958709 Retail $2,500 Special $988. With coupon code: AFFTRUE988 Plus Get Free Shipping. Bulova, BVA Series, Men's Watch, Stainless Steel Case, Stainless Steel Bracelet, Mechanical Automatic (Self-Winding). Buy this Bulova Men's BVA Series Watch Model: 96A128 Retail $425 Special $128. With coupon code: AFFSERIES128 at checkout. Plus Get Free Shipping. Calvin Klein, Dart, Men's Watch, Stainless Steel Case, Rubber Strap, Swiss Quartz (Battery-Powered). And buy this Calvin Klein Men's Dart Watch Model: K2S371VN Retail $495 Special $138. With coupon code: AFFDART138 at checkout. Plus Get Free Shipping. Hamilton, Linwood, Women's Watch, Stainless Steel Case, Leather Strap, Swiss Quartz (Battery-Powered). And buy this Hamilton Women's Linwood Watch Model# H18251735 Retail $395 Special $138. With coupon code: AFFLINWOOD138 at checkout. Plus Get Free Shipping! Movado, Movado LX, Women's Watch, Stainless Steel Case, Stainless Steel Bracelet, Swiss Quartz (Battery-Powered). And buy this Movado Women's Movado LX Watch Model# 0606619 Retail $1,495 Special $449. With coupon code: AFFMOVLX449 at checkout. Plus Get Free Shipping! Rado, Rado True Jubile, Men's Watch, Ceramic Case, Ceramic Bracelet, Swiss Quartz (Battery-Powered). And buy this Rado True Jubile Watch Model: R27653742 Retail $1,550 Special $668. With coupon code: AFFRTRUE668 at checkout. Plus Get Free Shipping! Calvin Klein, Delight, Women's Watch, Stainless Steel Case,Stainless Steel Bracelet Bangle Type, Swiss Quartz (Battery-Powered). And buy this Calvin Klein Women's Delight Watch Model: K1A24706 Retail $285 Special $88. With coupon code: AFFDELIGHT88 at checkout. Plus Get Free Shipping. Bulova, Marine Star, Men's Watch, Stainless Steel Case, Stainless Steel Bracelet, Japanese Quartz (Battery-Powered). So buy this Bulova Men's Marine Star Watch Model: 98B206 Retail $499 Special $109. With coupon code: AFFMARINE109 at checkout. Plus Get Free Shipping. Movado, Amorosa, Women's Watch, Stainless Steel Case, Stainless Steel Bracelet, Swiss Quartz (Battery-Powered). And buy this Movado Women's Amorosa Watch Model: 0606812 Retail $595 Special $225. With coupon code: AFFAMOR225 at checkout. Plus Get Free Shipping. Hamilton, Khaki Aviation Auto, Men's Watch, Stainless Steel Case, Stainless Steel Bracelet, Swiss Mechanical Automatic (Self-Winding). So buy this Hamilton Men's Khaki Aviation Watch Model: H76565135 Retail $795 Now $318. With coupon code: AFFKHAKI318 at checkout. Plus Get Free Shipping. Rado D-Star Chronograph men's watch. Ceramos case on a stainless steel bracelet. Ceramos� is made of high-tech ceramic and a metal composite that was designed to have the optimal properties of both components. A unique platinum steel look and lightweight material makes it ideal for sharp and edgy designs. So buy this Rado Men's D-Star Chronograph Ceramos Watch Model: R15937163 Retail $1,695 Special $598. With coupon code: AFFCERAM598 at checkout. Plus Get Free Shipping. Coach, Signature, Women's Watch, Stainless Steel Case, Silicon Strap, Japanese Quartz (Battery-Powered). So buy this Coach Women's Signature Watch Model: 14501881 Retail $178 Special $75. With coupon code: AFFSIGN75 at checkout. Plus Get Free Shipping. Calvin Klein, Basic, Men's Watch, Stainless Steel Gray PVD Coated Case, Stainless Steel Gray PVD Coated Bracelet, Swiss Quartz (Battery-Powered). And buy this Calvin Klein Men's Basic Watch Model: K2A27926 Retail $555 Special $118. With coupon code: AFFBASICCK118 at checkout. Plus Get Free Shipping. Movado, Circa, Men's Watch, Stainless Steel Case, Leather Crocodile Strap, Swiss Quartz (Battery-Powered). So buy this Movado Men's Circa Watch Model: 0606586 Retail $995 Special $249. With coupon code: AFFCIRCA249 at checkout. Plus Get Free Shipping! Hamilton, Khaki Aviation, Men's Watch, Stainless Steel Case, Leather Strap, Swiss Mechanical Automatic (Self-Winding). And buy this Hamilton Men's Khaki Aviation Watch Model: H76665835 Retail $795 Now $318. With coupon code: AFFAVIATN318 at checkout. Plus Get Free Shipping. Rado D-Star men's watch. Ceramos case on a stainless steel bracelet. Ceramos� is made of high-tech ceramic and a metal composite that was designed to have the optimal properties of both components. A unique platinum steel look and lightweight material makes it ideal for sharp and edgy designs. And buy this Rado Men's D-Star Ceramos Watch Model: R15946103 Retail $1,695 Special $648. With Coupon Code: AFFCERAMOS648 at checkout. Plus Get Free Shipping! Calvin Klein, Strive, Women's Watch, Stainless Steel Case, Stainless Steel Bracelet, Swiss Quartz (Battery-Powered). And buy this Calvin Klein Women's Strive Watch Model: K0K23107 Retail $290 Special $75. With coupon code: AFFSTRIVE75 at checkout. Plus Get Free Shipping! Bulova, Classic, Men's Watch, Stainless Steel and Yellow Gold Plated Case, Stainless Steel Bracelet, Japanese Quartz (Battery-Powered). And buy this Bulova Men's Classic Watch Model: 98B175 Retail $375 Special $99. With coupon code: AFFCLASSI99 at checkout. Plus Get Free Shipping! Rado, Rado True, Men's Watch, Ceramic with Plasma Treatment Case, Ceramic with Plasma Treatment Bracelet, Swiss Mechanical Automatic (Self-Winding), So buy this Rado Men's Rado True Watch Model: R27351102 Retail $1,600 Special $598. With coupon code: AFFTRUE598 at checkout. Plus Get Free Shipping! Hamilton, Khaki Field Pioneer Auto Chrono, Men's Watch, Stainless Steel Case, Leather Strap, Swiss Mechanical Automatic (Self-Winding), And buy this Hamilton Men's Khaki Field Pioneer Auto Chrono Watch Model: H60416533 Retail $1,945 Special $758. With coupon code: AFFPIONEER758 at checkout. Plus Get Free Shipping! Corum, Admiral's Cup Legend 38 Mystery Moon, Women's Watch, Stainless Steel Case, Satin Over Leather Strap, Swiss Mechanical Automatic (Self-Winding). So buy this Corum Women's Admiral's Cup Legend 38 Mystery Moon Watch Model: 384-101-47-0F49-AA01 Retail $15,000 Special $4,888. With Coupon Code: AFFCOR4888 at checkout. Plus Get Free Shipping! Bulova, Fairlawn, Women's Watch, Stainless Steel Case, Stainless Steel Bracelet, Quartz (Battery-Powered), 96R160. So buy this Bulova Women's Fairlawn Watch Model: 96R160 Retail $450 Deal Price $89. With Coupon Code: AFFLAWN89 at checkout. Plus Get Free Shipping. Calvin Klein, Cogent, Men's Watch, Stainless Steel Case, Leather Strap, Swiss Quartz (Battery-Powered), K3B2T1C6. And buy this Calvin Klein Men's Cogent Watch Model: K3B2T1C6 Retail $445 Special $118 + Free Fossil Necklace � Retail Value $25!! Use coupon code: Code: AFFCKGIFT118 at checkout. Hamilton, Khaki Field, Women's Watch, Stainless Steel Case, Stainless Steel Bracelet, Swiss Quartz (Battery-Powered), H72211139. And buy this Hamilton Women's Khaki Field Watch Model# H72211139 Retail $445 Special Price $128. With Coupon Code: AFFKHAKI128 at checkout. Plus Get Free Shipping! Edox, Les Vauberts Chronograph, Men's Watch, Stainless Steel Case, Stainless Steel Bracelet, Swiss Quartz (Battery-Powered), 10409-3A-AIN. And buy this Edox Men's Les Vauberts Chronograph Watch Model: 10409-3A-AIN Retail $1,029 Special Price $268. With Coupon Code: AFFLES268 at checkout. Plus Get Free Shipping. Rado, Original, Men's Watch, Stainless Steel Case, Stainless Steel Bracelet, Swiss Mechanical Automatic (Self-Winding), R12637153. And buy this Rado Men's Original Watch Model: R12637153 Retail $1,150 Special Price $458. With Coupon Code: AFFORIGINAL458 at checkout. Plus Get Free Shipping! Baume and Mercier Men's Hampton Watch Model: MOA10027 or MOA10028 Retail $3,600 Special Price $899. With Coupon Code: AFFHAMPTON899 at checkout. Plus Get Free Shipping. Seiko, Strap, Women's Watch, Stainless Steel and Rose Gold Plated Case, Leather Calf Skin Strap, Japanese Quartz (Battery-Powered), SUR871. So bu this Seiko Women's Strap Watch Model: SUR871 Retail $240 Special $72. With coupon code: AFFSTRAP72 at checkout. Plus Get Free Shipping. Calvin Klein, Strive, Men's Watch, Stainless Steel Rose Gold PVD Coated Case, Leather Strap, Swiss Quartz (Battery-Powered), K0K28620. So buy this Calvin Klein Men's Strive Watch Model: K0K28620 Retail $520 Special $168. With coupon code: AFFSTRIVE168. Plus Get Free Shipping. Bulova Accutron, Masella, Women's Watch, Stainless Steel Case, Stainless Steel Bracelet, Swiss Quartz (Battery-Powered), 63R34. So buy this Bulova Accutron Women's Masella Watch Model: 63R34 Retail $1,995 Special $338. With coupon code: AFFMASELLA338 at checkout. Plus Get Free Shipping. Hamilton, Jazzmaster Slim, Men's Watch, Stainless Steel Rose Gold Plated Case, Leather Strap, Swiss Mechanical Automatic (Self-Winding), H38645755. So buy this Hamilton Men's Jazzmaster Slim Watch Model: H38645755 Retail $1,245 Special $568. With coupon code: AFFSLIM568 at checkout. Plus Get Free Shipping. Rado, Integral, Men's Watch, Stainless Steel Case, Stainless Steel and Ceramic Bracelet, Swiss Quartz (Battery-Powered), R20784152. So buy this Rado Men's Integral Watch Model: R20784152 Retail $2,000 Special Now $758. With coupon code: AFFINTEG758 at checkout. Plus Get Free Shipping. Calvin Klein, Graceful, Women's Watch, Stainless Steel Case, Stainless Steel Bracelet, Swiss Quartz (Battery-Powered), K1P23104. Buy this Calvin Klein Women's Graceful Watch Model: K1P23104 Retail $350 Special Price $88. With coupon code: AFFGRAC88 at checkout. Plus Get Free Shipping! Bulova, Fairlawn, Women's Watch, Stainless Steel Rose Gold Plated Case, Stainless Steel Rose Gold Plated Bracelet, Quartz (Battery-Powered), 98R156. So buy this Bulova Women's Fairlawn Watch Model: 98R156 Retail $499 Special Price $118. With coupon code: AFFFAIR118 at checkout. Plus Get Free Shipping! Hamilton, Khaki Aviation, Men's Watch, Stainless Steel Case, Leather Strap, Swiss Mechanical Automatic (Self-Winding), H76665725. And buy this Hamilton Men's Khaki Aviation Watch Model: H76665725 Retail $795 Special Price $318. With coupon code: AFFAVIATION318 at checkout. Plus Get Free Shipping! Rado, Centrix, Men's Watch, Stainless Steel Yellow Gold PVD Coated Case, Stainless Steel Yellow Gold PVD Coated Bracelet, Swiss Mechanical Automatic (Self-Winding), R30279153. And buy this Rado Men's Centrix Watch Model: R30279153 Retail $1,450 Special Price $568. With coupon code: AFFCENTRIX568 during checkout. Plus Get Free Shipping! Concord, C1 Retrograde, Men's Watch, Titanium and Rubber Case, Rubber Strap, Swiss Mechanical Automatic (Self-Winding), 0320054. Buy this Concord Men's C1 Retrograde Watch Model: 0320054 Retail $14,290 Special Price $2,495. With coupon code: AFFRETRO2495 at checkout. Plus Get Free Shipping! Seiko, Bracelet, Women's Watch, Stainless Steel Case, Stainless Steel Bracelet, Japanese Quartz (Battery-Powered). And buy this Seiko Women's Bracelet Watch Model: SXDF89 Was $199.99 Now $49. With coupon code: AFFSK49 at checkout. Plus Get Free Shipping! Calvin Klein, Basic, Men's Watch, Stainless Steel Case, Leather Strap, Swiss Quartz (Battery-Powered). And buy this Calvin Klein Men's Basic Watch Model: K2A27188 Retail $425 Now Special $89.99. With coupon code: AFFBASIC89 at checkout. Plus Get Free Shipping! Hamilton, Khaki Field, Men's Watch, Stainless Steel Case, Leather Strap, Swiss Quartz (Battery-Powered). So buy this Hamilton Men's Khaki Field Watch Model: H74451833 Retail $395 Now Special $149. With coupon code: AFFFIELD149 at checkout. Plus Get Free Shipping! Bulova, BVA Series, Women's Watch, Stainless Steel Case, Stainless Steel Bracelet, Mechanical Automatic (Self-Winding). And buy this Bulova Women's BVA Series Watch Model: 96R155 Retail $699 Now Special $169. With coupon code: AFFSERIES169 at checkout. Plus Get Free Shipping! Rado, Rado True Jubile, Women's Watch, Ceramic Case, Ceramic Bracelet, Swiss Quartz (Battery-Powered). And buy this Rado Women's Rado True Jubile Watch Model: R27695712 Retail $1,500 Now $668. With coupon code: AFFTRUE668 at checkout. Plus Get Free Shipping! Valentine's Day - Time For Love! Valentine's Day - Time For Love! Find the perfect gift for that perfect person! Get Free Shipping! Complimentary Godiva chocolates with orders $199 and above! Shop Now. Calvin Klein, Concept, Men's Watch, Stainless Steel Black PVD Coated Case, Leather Strap, Swiss Quartz (Battery-Powered). Buy this Calvin Klein Men's Concept Watch Model: K1U21402 Retail $365 Now $79.99. With coupon code: AFFCONCEPT79 at checkout. Plus Get Free Shipping. Bulova, Fairlawn, Women's Watch, Stainless Steel Case, Stainless Steel Bracelet, Quartz (Battery-Powered). And buy this Bulova Women's Fairlawn Watch Model: 96R160 Retail $450 Now $89. With coupon code: AFFAIRLAWN89 at checkout. Plus Get Free Shipping. Baume and Mercier, Classima Executives, Men's Watch, Stainless Steel Case, Leather Alligator Strap, Swiss Quartz (Battery-Powered). So buy this Baume and Mercier Men's Classima Executives Watch Model: MOA10098 Retail $1,750 Now $699. With coupon code: AFFCLASSIMA699 at checkout. Plus Get Free Shipping. Rado, D-Star 200, Men's Watch, Stainless Steel Yellow Gold PVD Coated and Ceramic Case, Stainless Steel Yellow Gold PVD Coated and Ceramic Bracelet, Swiss Mechanical Automatic (Self-Winding). And buy this Rado Men's D-Star 200 Watch Model: R15961162 Retail $2,195 Now $899. With coupon code: AFFDSTAR899 at checkout. Plus Get Free Shipping. Zenith, Captain Central Second Boutique Edition, Men's Watch, 18K Rose Gold Case, Leather Alligator Over Rubber Strap, Swiss Mechanical Automatic (Self-Winding). So buy this Zenith Men's Captain Central Second Boutique Edition Watch Model: 18-2021-670-38-C498 Retail $14,500 Now $5,188. With coupon code: AFFCENTRAL5188 at checkout. Plus Get Free Shipping. Calvin Klein, Sophistication, Women's Watch, Stainless Steel Yellow Gold Plated Case, Leather Strap, Swiss Quartz (Battery-Powered). And buy this Calvin Klein Women's Sophistication Watch Model: K1B23609 Retail $400 Now $78. With coupon code: AFFSOPHIS78 at checkout. Plus Get Free Shipping. Bulova, Precisionist Brightwater, Women's Watch, Stainless Steel Case, Stainless Steel Bracelet, Japanese Quartz (Battery-Powered). And buy this Bulova Women's Precisionist Brightwater Watch Model: 96R153 Retail $650 Now $138. With coupon code: AFFBRIGHT138 at checkout. Plus Get Free Shipping. Hamilton, Khaki Aviation QNE, Men's Watch, Stainless Steel Case, Stainless Steel Bracelet, Swiss Mechanical Automatic (Self-Winding). So buy this Hamilton Men's Khaki Aviation QNE Watch Model: H76655133 Retail $1,245 Now $475. Use coupon code: AFFKHAKI475 at checkout. Plus Get Free Shipping. Rado, Rado True, Men's Watch, Ceramic Case, Ceramic Bracelet, Swiss Mechanical Automatic (Self-Winding). And buy this Rado Men's Rado True Watch Model: R27857172 Retail $1,500 Now $599. With coupon code: AFFRTRUE599 during checkout. Plus Get Free Shipping. Concord, C1 Big Date, Men's Watch, Stainless Steel and Rubber Case, Rubber Strap, Swiss Mechanical Automatic (Self-Winding). So buy this Concord Men's C1 Big Date Watch Model: 0320044 Retail $15,300 Now $2,595. With coupon code: AFFBIG2595 at checkout. Plus Get Free Shipping. Calvin Klein, Air, Women's Watch, Stainless Steel Yellow Gold Plated Case,Stainless Steel Yellow Gold Plated Bracelet Bangle Type, Swiss Quartz (Battery-Powered). So buy this Calvin Klein Women's Air Watch Model: K1N22520 Was $490 Now $128. Plus Get Free Shipping! Movado, Linio, Women's Watch, Stainless Steel Case, Stainless Steel Bracelet, Swiss Quartz (Battery-Powered), 0606736. And buy this Movado Women's Linio Watch Model: 0606736 Was $695 Now $199. With Coupon Code: AFFLINIO199 at checkout. Plus Get Free Shipping! Bulova Accutron, Masella, Women's Watch, Stainless Steel Case, Stainless Steel Bracelet, Swiss Quartz (Battery-Powered), 63R34. And buy this Bulova Accutron Women's Masella Watch Model: 63R34 Was $1,995 Now $338. With Coupon Code: AFFMASELLA338 at checkout. Plus Get Free Shipping! Rado, Rado True Jubile, Men's Watch, Ceramic with Plasma Treatment Case, Ceramic with Plasma Treatment Bracelet, Swiss Quartz (Battery-Powered), R27654742. So buy this Rado Men's Rado True Jubile Watch Model: R27654742 Was $1,600 Now $629. With Coupon Code: AFFRADOT629 at checkout. Plus Get Free Shipping. Hamilton, Khaki Field Chrono Auto, Men's Watch, Stainless Steel Case, Stainless Steel Bracelet, Swiss Mechanical Automatic (Self-Winding), H71566133. So buy this Hamilton Men's Khaki Field Chrono Auto Watch Model: H71566133 Was $1,595 Now Special $638. With Code: AFFKHAKI638 at checkout. Free shipping. Calvin Klein, Grid, Women's Watch, Stainless Steel Case, Stainless Steel Bracelet Cuff Type, Swiss Quartz (Battery-Powered). And buy this Calvin Klein Women's Grid Watch Model: K8323120 Was $390 Now $38. With coupon code: AFFGRID38 at checkout. Plus Get Free Shipping. Bulova, Classic, Women's Watch, Stainless Steel Rose Gold Plated Case, Stainless Steel Rose Gold Plated Bracelet, Japanese Quartz (Battery-Powered). And buy this Bulova Women's Classic Watch Model: 97L124 Retail $350 Now $88. With coupon code: AFFCLASSIC88 at checkout. Plus Get Free Shipping. Movado, Corporate Exclusive, Men's Watch, Stainless Steel Case, Stainless Steel Bracelet, Swiss Quartz (Battery-Powered). So buy this Movado Men's Corporate Exclusive Watch Model: 0605973 Retail $895 Now $286. With coupon code: AFFCORP286 at checkout. Plus Get Free Shipping. Hamilton, Khaki Navy Regatta Alarm, Men's Watch, Stainless Steel Case, Stainless Steel Bracelet, Swiss Quartz (Battery-Powered). And buy this Hamilton Men's Khaki Navy Regatta Alarm Watch Model: H77614133 Retail $695 Now $318. With coupon code: AFFKHAKI318 at checkout. Plus Get Free Shipping. Rado, Rado True, Men's Watch, Ceramic with Plasma Treatment Case, Ceramic with Plasma Treatment Bracelet, Swiss Quartz (Battery-Powered). Buy this Rado Men's Rado True Watch Model: R27654162 Retail $1,300 Now $488. With coupon code: AFFTRUE488 at checkout. Plus Get Free Shipping. Seiko, Bracelet, Men's Watch, Stainless Steel and Yellow Gold Plated Case, Stainless Steel and Yellow Gold Plated Bracelet, Japanese Quartz (Battery-Powered). So buy this Seiko Men's Bracelet Watch Model: SUR033 Was $219.99 Now $52. Plus Get Free Shipping! With Code: AFFBCLT52 at checkout. Calvin Klein, Glow, Women's Watch, Stainless Steel Case, Leather Strap, Swiss Quartz (Battery-Powered). And buy this Calvin Klein Women's Glow Watch Model: K2B23137 Retail: $575 Special: $148. Plus Gift of CK Jeans Jewelry - Retail Value $140. With Code: AFFGLOWGIFT. Hamilton, Khaki Aviation, Men's Watch, Stainless Steel Case, Stainless Steel Bracelet, Swiss Mechanical Automatic (Self-Winding). So buy this Hamilton Men's Khaki Aviation Watch Model: H76665125 Retail Price: $845 Special Price: $338. With Coupon Code: AFFAVIATN338 at checkout. Plus Get Free Shipping. Movado, Concerto, Men's Watch, Stainless Steel Case, Stainless Steel and Yellow Gold Plated Bracelet, Swiss Quartz (Battery-Powered). So buy this Movado Men's Concerto Watch Model: 0606588 Retail Price: $1,295 Special Price: $399. With Coupon Code: AFFCONCERT399 at checkout. Plus Get Free Shipping. Rado, D-Star, Men's Watch, Ceramos (Hi-Tech Ceramic and Metal Composite) Case, Stainless Steel Bracelet, Swiss Mechanical Automatic (Self-Winding). So buy this Rado Men's D-Star Watch Model: R15938153 Was $1,695 Now Special $648. With Coupon Code: AFFSTAR648 at checkout. Plus Get Free shipping! Seiko, Core, Men's Watch, Stainless Steel Case, Rubber Strap, Solar Powered Quartz. And buy this Seiko Men's Core Watch Model: SNE277 Was $225 Now $59.99 + get free shipping! Use coupon code: AFFCORE59 during checkout. Calvin Klein, Modern, Women's Watch, Stainless Steel Case, Satin Over Leather Strap, Swiss Quartz (Battery-Powered). And buy this Calvin Klein Women's Modern Watch Model: K1I23526 Was $245 Now $68. Plus get free shipping! Use coupon code: AFFMODERN68 at checkout. Bulova Accutron, Stratford, Men's Watch, Stainless Steel Case, Stainless Steel Bracelet, Swiss Quartz (Battery-Powered). So buy this Bulova Accutron Men's Stratford Watch Model: 63B158 Was $895 Now $158. Plus Get Free Shipping! Use coupon code: AFFSTRAT158 at checkout. Hamilton, Khaki Aviation QNE, Men's Watch, Stainless Steel Case, Stainless Steel Bracelet, Swiss Mechanical Automatic (Self-Winding). And buy this Hamilton Men's Khaki Aviation QNE Watch Model: H76655123 Was $1,245 Now $498. plus get free shipping! Use coupon code: AFFQNE498 during checkout. Rado, Rado True, Men's Watch, Ceramic Case, Ceramic Bracelet, Swiss Quartz (Battery-Powered). And buy this Rado Men's Rado True Watch Model: R27653062 Retail: $1,200 Special Price: $528. Plus Get Free Shipping! Use Coupon Code: AFFRADO528 at Checkout. Hamilton Men's Khaki Chrono Watch Special Price $199. Hamilton, Khaki Chrono, Men's Watch, Stainless Steel Case, Stainless Steel Bracelet, Swiss Quartz (Battery-Powered), H68582133. So buy this Hamilton Men's Khaki Chrono Watch Model: H68582133 Retail: $645 Special: $199. Plus Get Free Shipping! Use Coupon Code: AFFCHRONO199 at checkout. Rado D-Star men's watch. Ceramos case on a stainless steel bracelet. Ceramos� is made of high-tech ceramic and a metal composite that was designed to have the optimal properties of both components. A unique platinum steel look and lightweight material makes it ideal for sharp and edgy designs. So buy this Rado Men's D-Star Watch Model: R15946153 Retail: $1,695 Special: $728. Plus Get Free Shipping! Use Coupon Code: AFFDSTAR728 at checkout. Baume and Mercier, Hampton, Men's Watch, Stainless Steel Case, Leather Alligator Strap, Swiss Mechanical Automatic (Self-Winding), So buy this Baume and Mercier Men's Hampton Watch Model: MOA10029 Retail: $4,950 Ashford: $2,623.50 SNEAK PEEK: $1,385 + Free Shipping! No code needed. Calvin Klein, Conversion, Men's Watch, Stainless Steel Case, Leather Strap, Swiss Quartz (Battery-Powered). Buy this Calvin Klein Men's Conversion Watch Model: K9711102 Was $325 Now $65. Use Coupon Code: AFFCONVERS65 at checkout. ESQ by Movado, Corbel, Women's Watch, Stainless Steel and Yellow Gold Plated Case, Stainless Steel and Yellow Gold Plated Bracelet, Swiss Quartz (Battery-Powered). And buy this ESQ by Movado Women's Corbel Watch Model: 07101443 Was $395 Now $99. With Coupon Code: AFFCORBEL99 at checkout. Seiko, Core, Men's Watch, Stainless Steel Black Ion Plated Case, Stainless Steel Black Ion Plated Bracelet, Kinetic Powered/Autoquartz. Buy this Seiko Men's Core Watch Model: SKA637 Was $400 Now $108. With Coupon Code: AFFCORE108 at checkout. Rado, D-Star 200, Men's Watch, Stainless Steel Yellow Gold PVD Coated and Ceramic Case, Stainless Steel Yellow Gold PVD Coated and Ceramic Bracelet, Swiss Mechanical Automatic (Self-Winding). And buy this Rado Men's D-Star 200 Watch Model: R15961162 Was $2,195 Now $899. With Coupon Code: AFFDSTAR899 at checkout. Hamilton, Timeless Classic Thin-O-Matic Auto, Men's Watch, Stainless Steel Yellow Gold Plated Case, Stainless Steel Yellow Gold Plated Bracelet Expandable Type, Swiss Mechanical Automatic (Self-Winding). So buy this Hamilton Men's Timeless Classic Thin-O-Matic Auto Watch Model: H38435221 Was $975 Now $418. With Coupon Code: AFFCLASSIC418 at checkout. Movado, Sports Edition, Men's Watch, Stainless Steel Case, Stainless Steel Bracelet, Swiss Quartz (Battery-Powered), So buy this Movado Men's Sports Edition Watch Model: 0605789 Was $1,195 Now $359. With Coupon Code: AFFEDITION359 at checkout. Bulova Accutron, Gemini, Men's Watch, Stainless Steel Case, Leather Strap, Swiss Mechanical Automatic (Self-Winding). Buy this Bulova Accutron Men's Gemini Watch Model: 63B153 Retail: $1,350 Special: $368. Use Coupon Code: AFFGEMINI368 at checkout. Rado Men's Rado True Jubile Watch. Buy this Rado Men's Rado True Jubile Watch Model: R27653742 or R27655742 Was $1,550 Special Price $688. With Coupon Code: AFFRADOS688 at checkout. Save $10 OFF on Order $90!! Save $10 Off on Order $90. Plus Get Free Shipping (Excludes sale items). With Coupon Code: AFF10 at checkout. Get 20% OFF on Tendence Watches. With coupon code: AFFTEND20. plus Get Free Shipping (Excludes sale items). More Tendence: Unique and contemporary with audacious design. Blending craftsmanship with avant-garde technology and the finest materials, Tendence watches signify individuality and creativity. Save 15% OFF on Seiko Watches. With coupon code: AFFSEIKO15. Plus Get Free Shipping (Excludes sale items). Shop Now. Get 15% OFF on Rado Watches. With coupon code: AFFRADO15. Plus Get Free Shipping (Excludes sale items). More Rado: An exceptional team of engineers, scientists and designers with an unflappable belief in strength of technology turned a simple clockwork manufacturer into an innovative and world-class brand. Get 15% OFF on Pulsar Watches. With coupon code: AFFPULS15. Plus Get Free Shipping (Excludes sale items). More Pulsar: Pioneers of technology and innovation. Pulsar created the first digital display watch and, today, still embody that spirit of adventure with affordable, cutting-edge design. Save 15% OFF on Movado Watches. With Coupon Code: AFFMOV15. Plus Get Free Shipping (Excludes sale items). More Movado: Bold, timeless and inspired. Movado watches offer excellent craftsmanship with stunning design, and are known for being lightweight and comfortable on the wrist. Take 8% OFF on Hamilton Watches. With coupon code: AFFHAM8. Plus Get Free Shipping (Excludes sale items). More Hamilton: Steeped in American heritage coupled with Swiss watchmaking ingenuity, Hamilton watches are the perfect blend of tradition, innovation, and elegance. Save 15% OFF on Ebel Watches. Plus Get Free Shipping (Excludes sale items). Use Coupon Code: AFFEBEL15 at Ashford.com. More Ebel: Whimsical and beautiful, with cutting-edge trends that draw on classic design. The Swiss brand seamlessly blends art and engineering with technology and design. Save 15% Off on Caravelle Watches. Plus Get Free Shipping (Excludes sale items). Use Coupon Code: AFFCARA15 at Ashford.com. More Caravelle: Exceptional quality and affordability. Caravelle watches are fashion forward and accessible, offering an array of styles with Swiss movements. Save 12% OFF on Breitling Watches. Plus Get Free Shipping (Excludes sale items). With Coupon Code: AFFBREIT12 at Ashford.com. More Breitling: Elegance. Performance. Precision. Breitling is a leader in the field of mechanical chronographs and has a long history partnering with the aviation history and the worlds elite pilots. Save 15% OFF on Calvin Klein from Ashford.com. Plus Get Free Shipping. Use coupon code: AFFCK15 at checkout. More Calvin Klein: Synonymous with American cool, Calvin Klein is a leader in the world of fashion. Combining style with modern simplicity. Calvin Klein watches also feature a Swiss movement. Save 15% OFF on Bulova Watches from Ashford.com. Get Free Shipping (Excludes sale items). Use Coupon Code: AFFBUL15. More Bulova: An American icon at the cutting-edge of technology. Bulova embodies invention and creativity to make watches that are infinitely reliable and precise with Swiss movements. Seiko Men's Core Watch. Seiko, Core, Men's Watch, Stainless Steel Case, Stainless Steel Bracelet, Kinetic Powered / Autoquartz. So buy this Seiko Men's Core Watch Model: SKA635 Was $359.99 Now $98. With Coupon Code: AFFCORE98 at checkout. Calvin Klein Women's Pensive Watch. Calvin Klein, Pensive, Women's Watch, Stainless Steel Yellow Gold PVD Coated Case, Stainless Steel Yellow Gold PVD Coated Bracelet Bangle Type, Swiss Quartz (Battery-Powered). So buy this Calvin Klein Women's Pensive Watch Model: K1T24501 Was $600 Now $158. With Coupon Code: CKPENSIVE. Plus Get FREE GIFT: KJ53BP020100 � Retail Value: $130!! Movado Men's Sportivo Watch. Movado, Sportivo, Men's Watch, Stainless Steel Case, Stainless Steel Bracelet, Swiss Quartz (Battery-Powered). And buy this Movado Men's Sportivo Watch Model: 0606481 Was $895 Now $309. With Coupon Code: AFFSPORT309. Rado Men's Original Watch. Rado, Original, Men's Watch, Stainless Steel Case, Stainless Steel Bracelet, Swiss Mechanical Automatic (Self-Winding). Buy this Rado Men's Original Watch Model: R12637013 Was $1,150 Now $448. With Coupon Code: AFFORIGIN448 at checkout. Zenith Men's Port Royal Watch. Zenith, Port Royal, Men's Watch, Stainless Steel Case, Leather Alligator Strap, Swiss Mechanical Manual (Hand-Winding). Buy this Zenith Men's Port Royal Watch Model: 03-5010-2562-91-C493 Now Only $1,875. With Coupon Code: AFFROYAL1875 at checkout. We provide a very wide variety of fashionable Jewelry and Luxury Watches. We offer 100% authentic, brand-new, brand-name merchandise from some of the finest manufacturers on the planet, all at discount prices. With our excellent reputation; no-hassle 30-day return policy; free shipping and savings up to 80%, you can be sure that converting with us is easy.